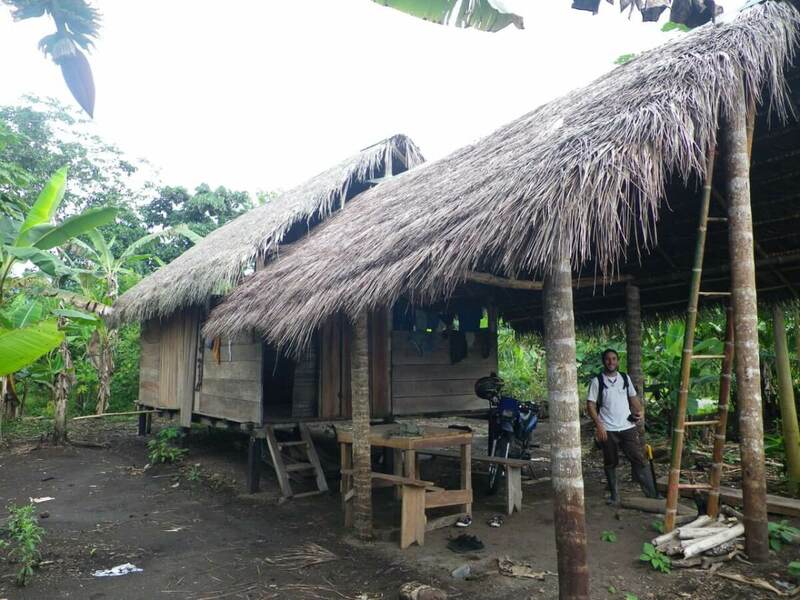 Ishpingo's teaching hut used for educational purposes. 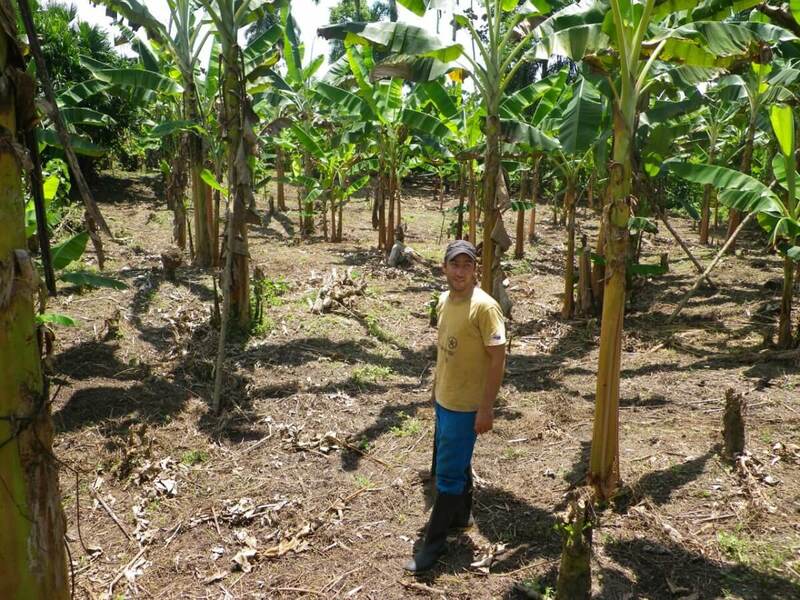 Antoine, standing in the middle of a banana plantation. 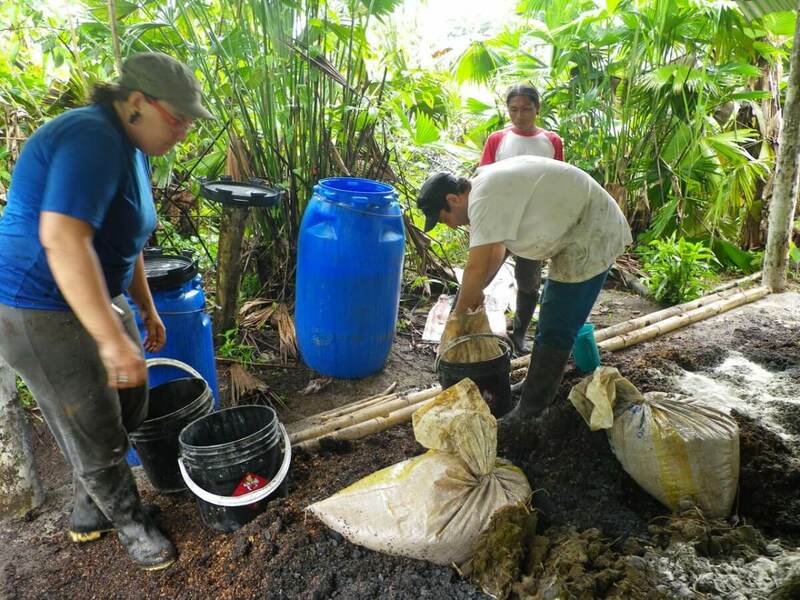 Activation of the micro-organisms preceeding the mix. 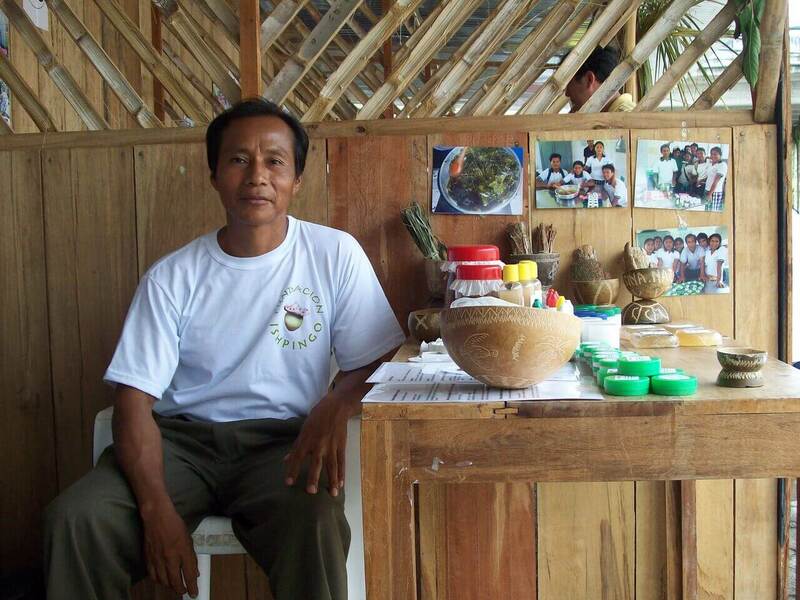 The teaching farm is an educational place for local populations training. 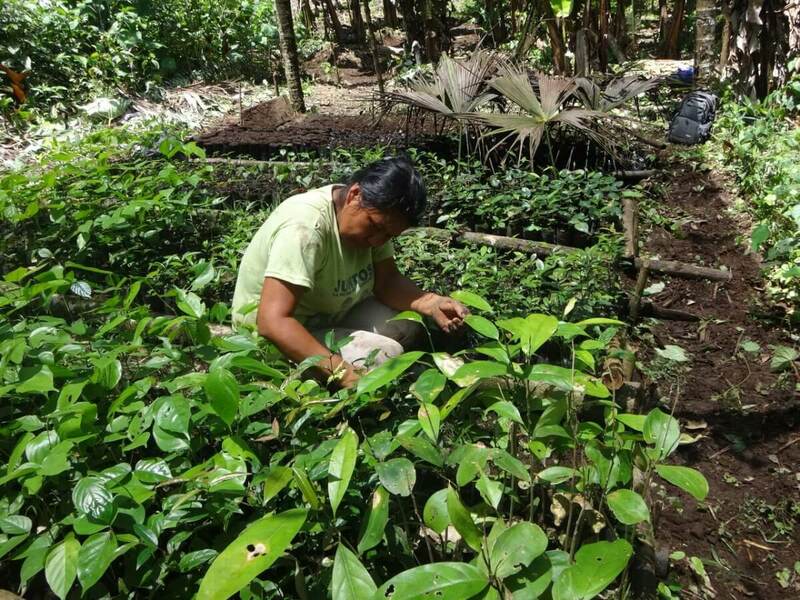 Tree nursery ensures a proper grow to young shoots. 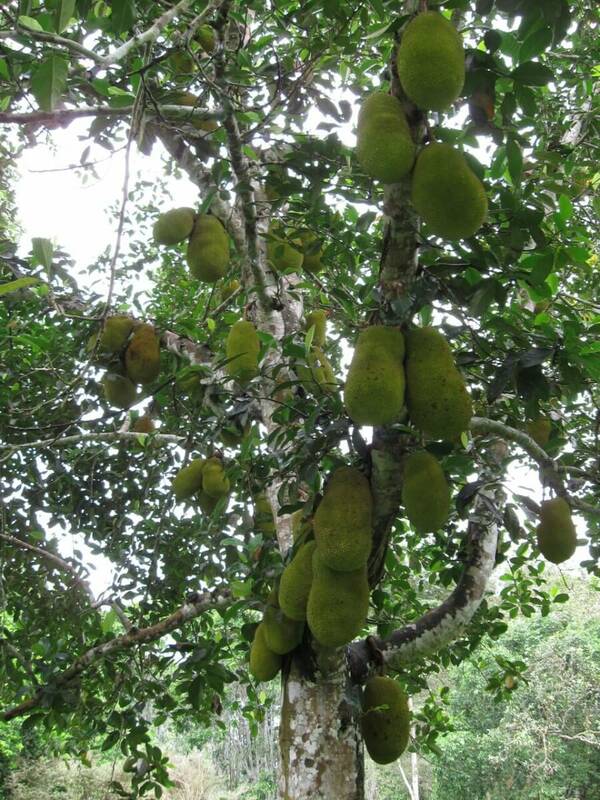 Some patches host fruit trees that have grown within the tree nursery. 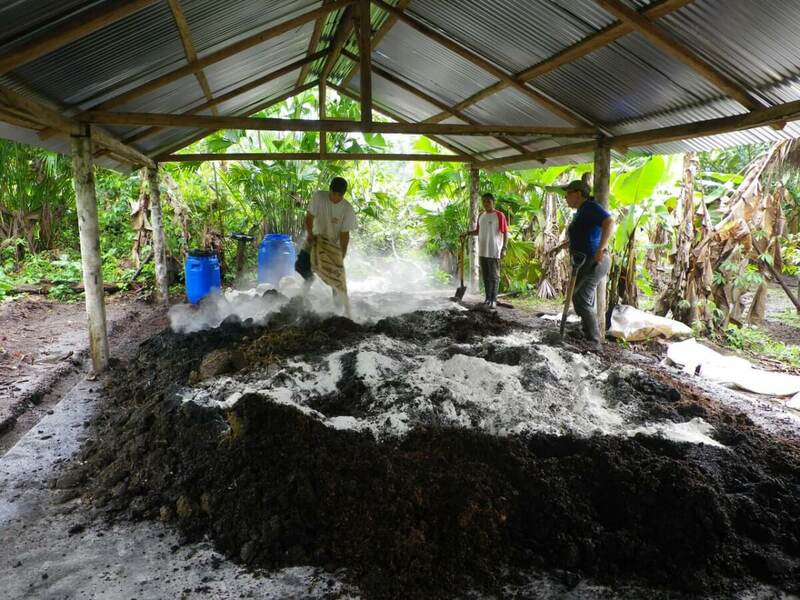 We add lime to create a bio fertilizer called Bokashi. 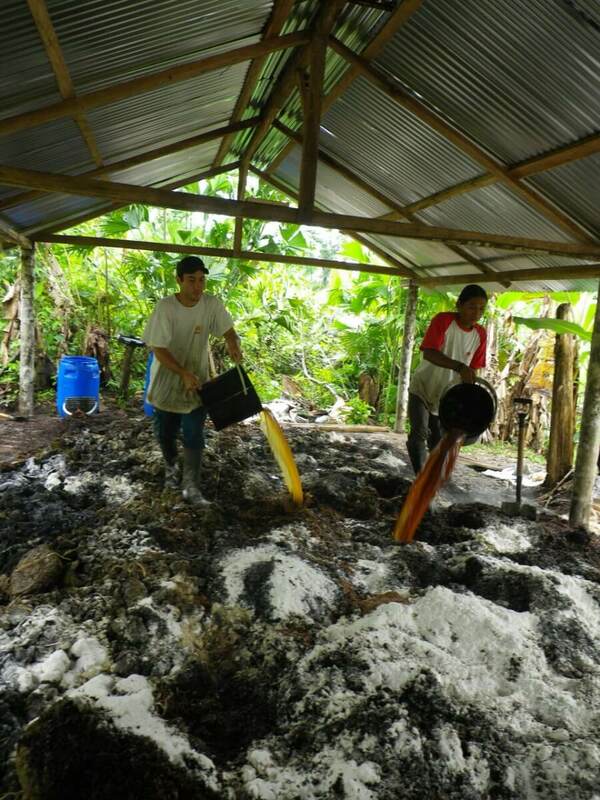 Activated micro-organisms is a major component of Boskashi bio fertilizer. 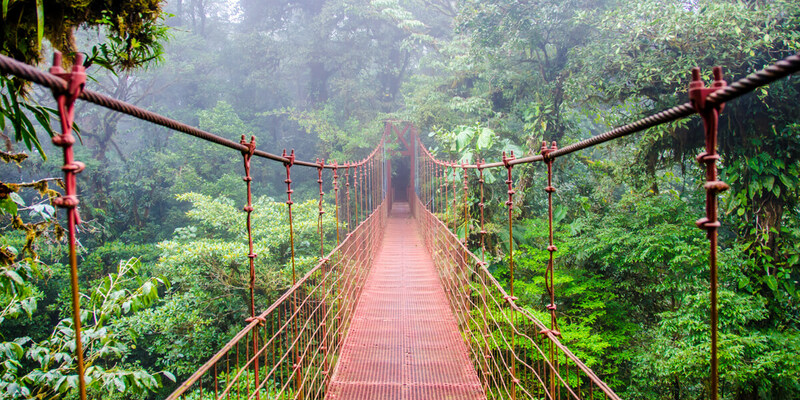 This impressive hanging bridge crosses the rainforest over an impassable river. 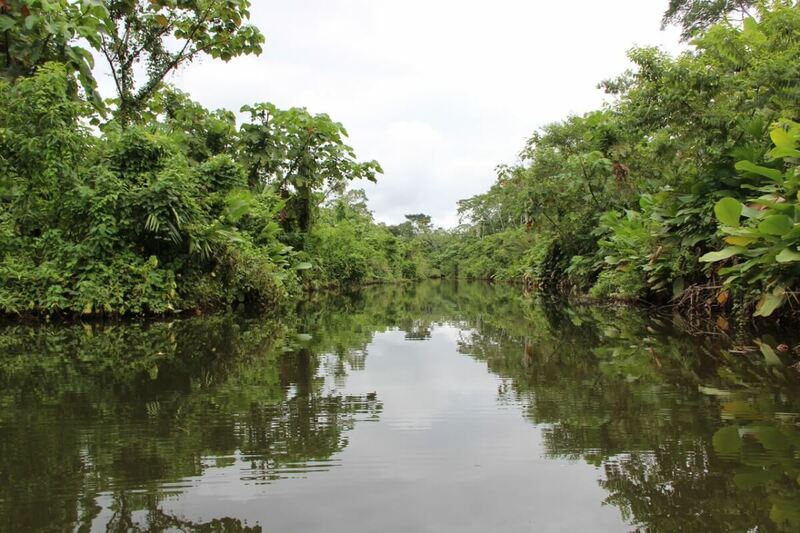 A peaceful river snakes through the rainforest in Ecuador. 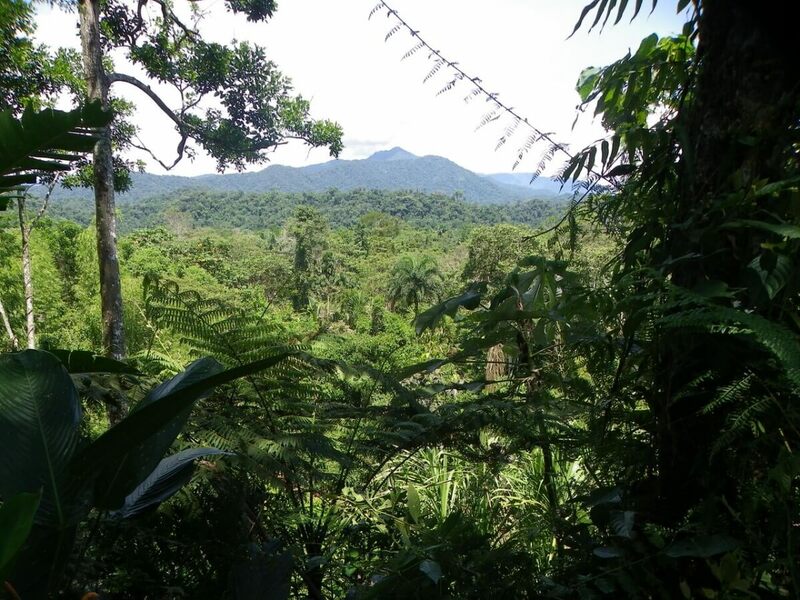 Ground view looking picture shot into the rainforest. 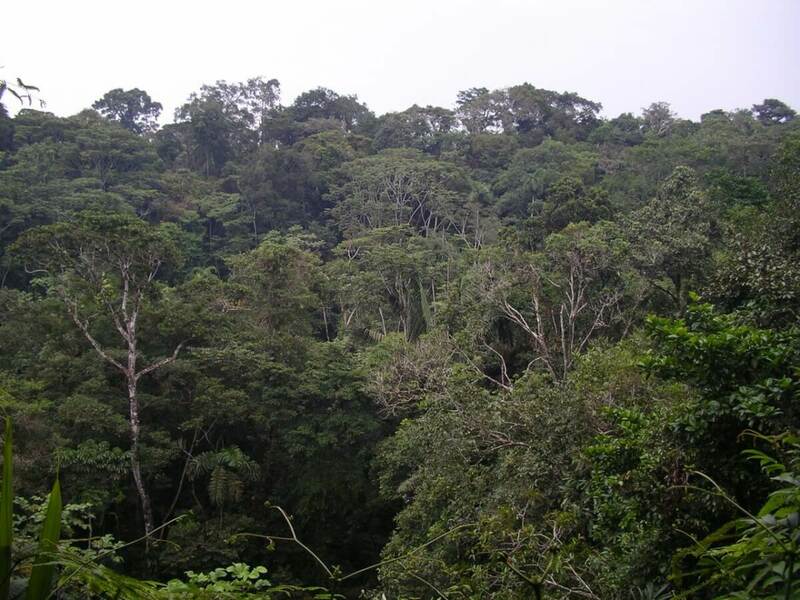 A nice specimen of ceboi tree amid a kichwa forest plot. 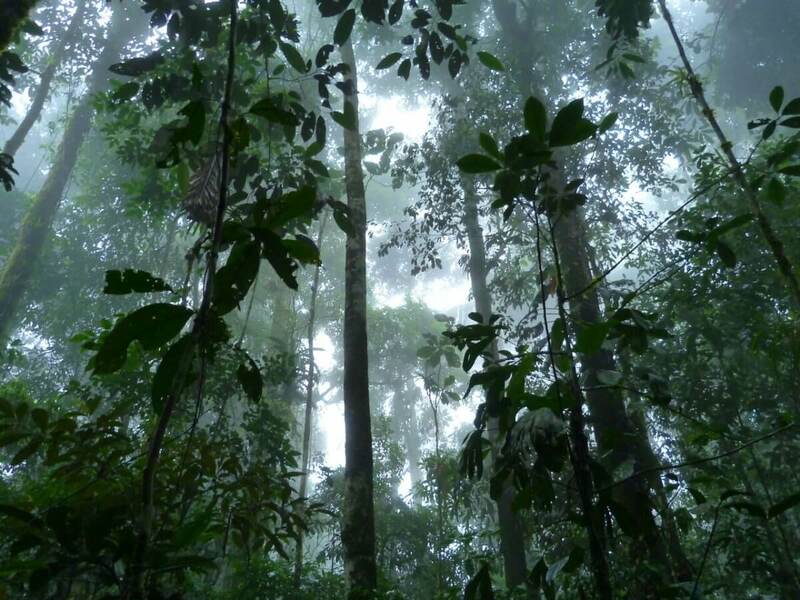 The characteristic landscape of the Amazon mangroves. 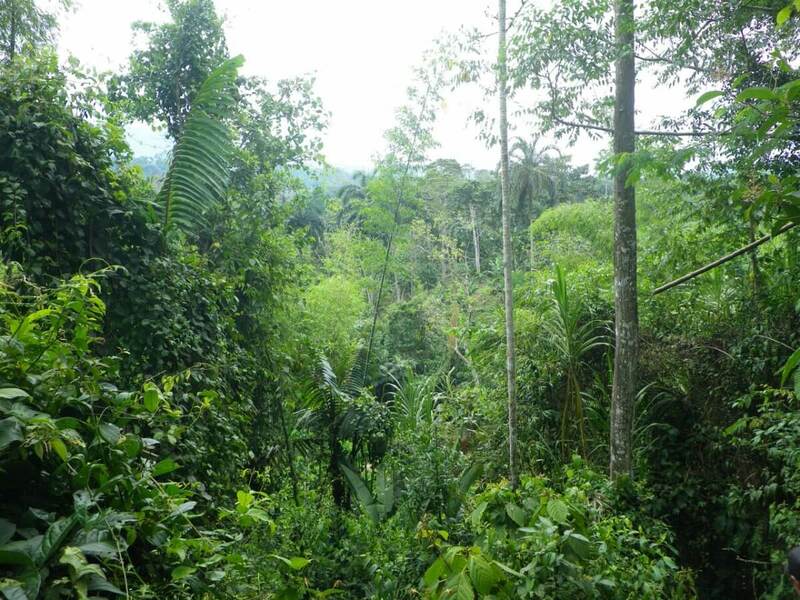 Dense and luxuriant vegetation of the rainforests. 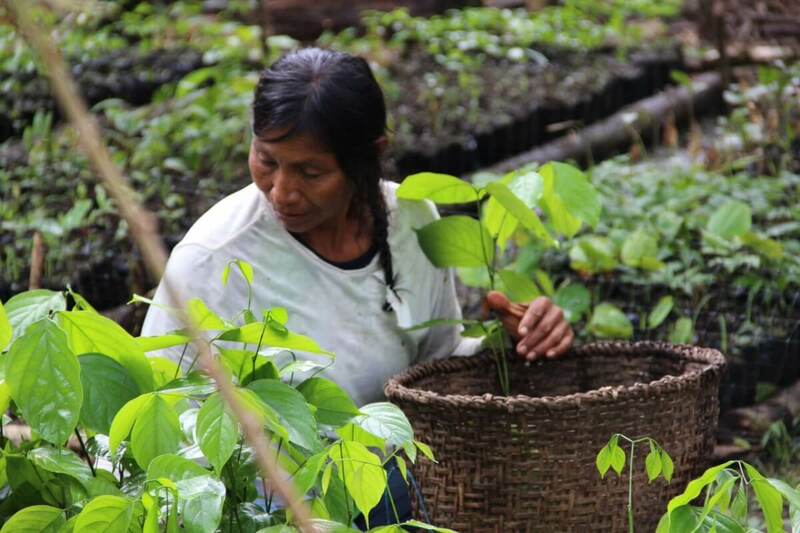 The Ecudorian valley of Napo toggles steep relief and dense forests. 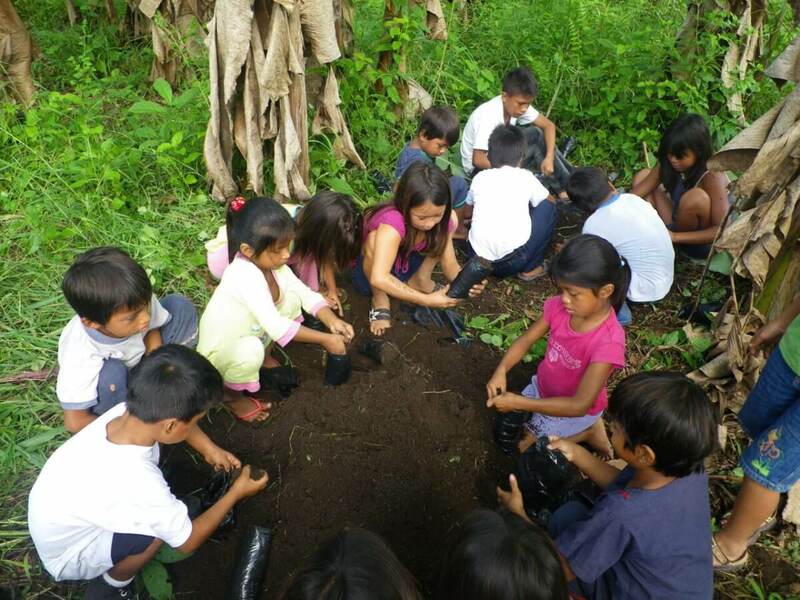 Educating young generation to sustainable development is our prime priority. 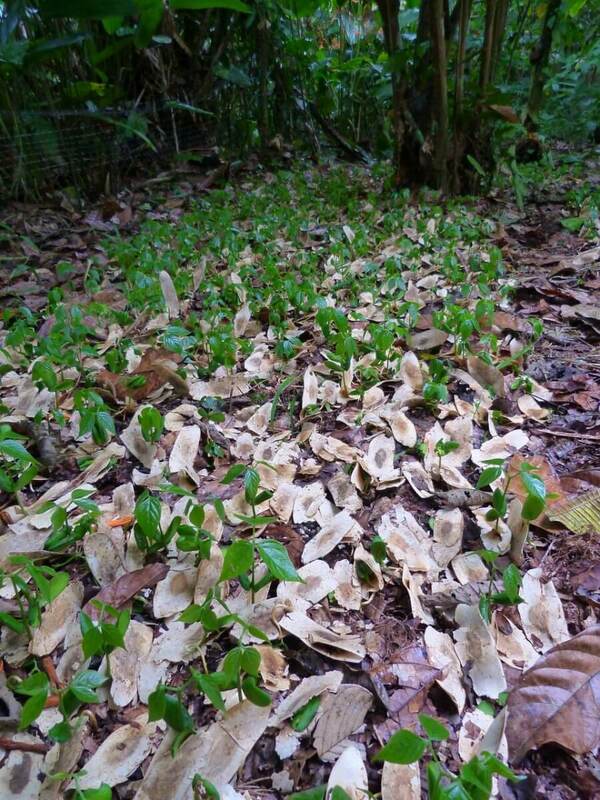 Being able to recognize the differents seeds and species favorizes biodiversity. 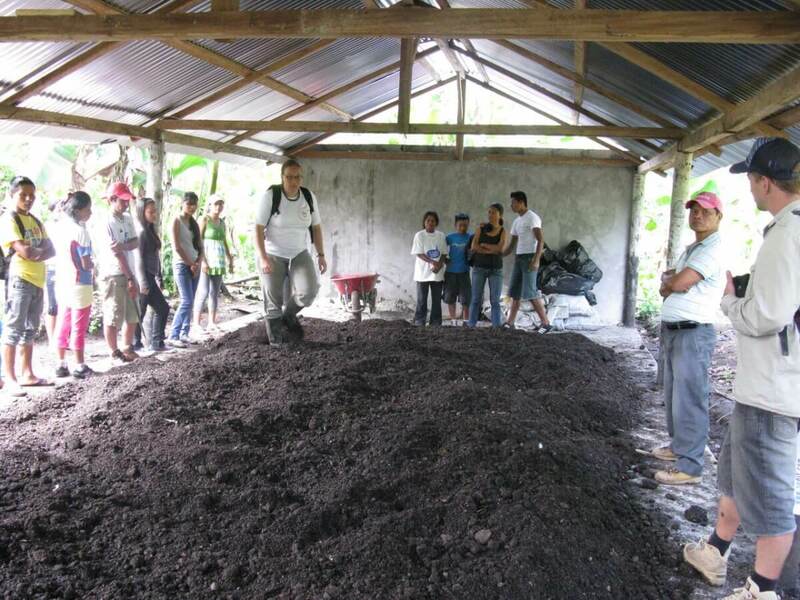 Teaching to local population how to make cheap and organic fertilizers. 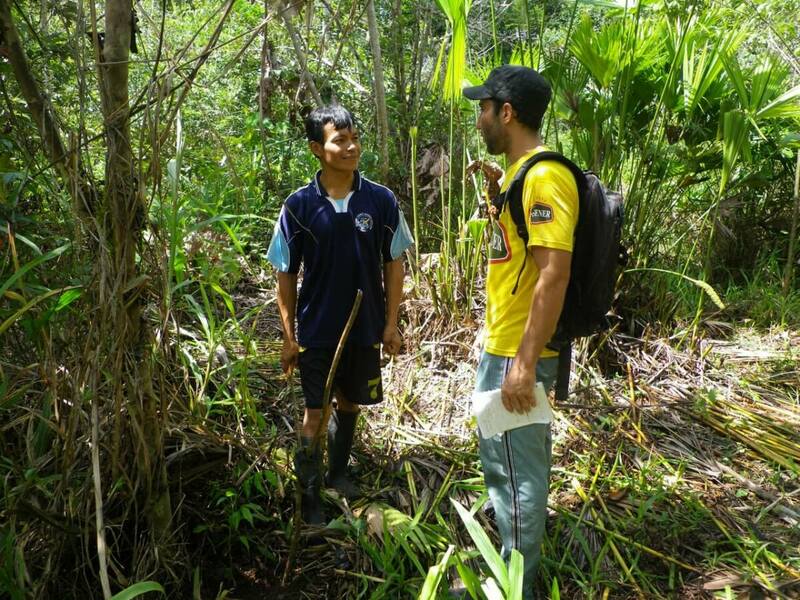 Teach and sensitize on the field is one of ishpingo's working method. 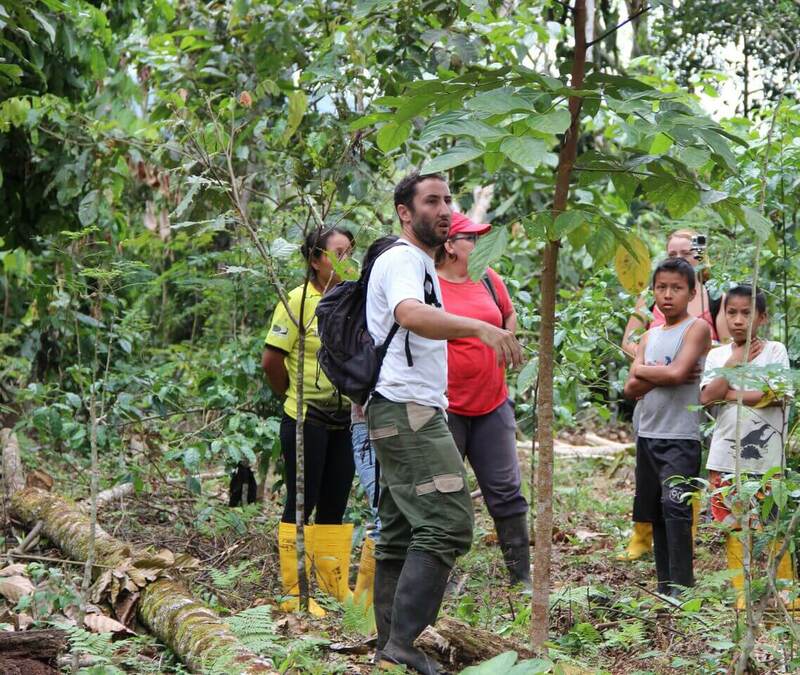 Explaining and demonstrating the virtues of agroforestry to the local farmers. 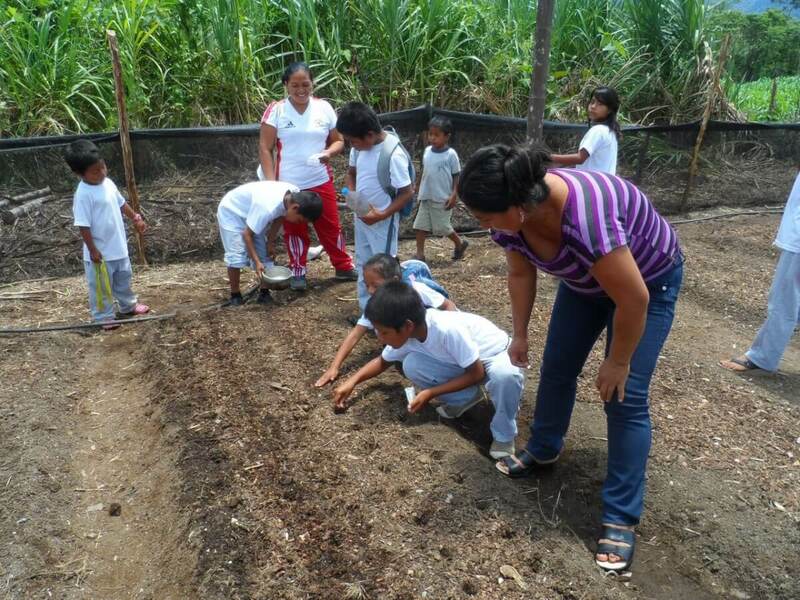 Young kichwas learning how to sow efficiently. 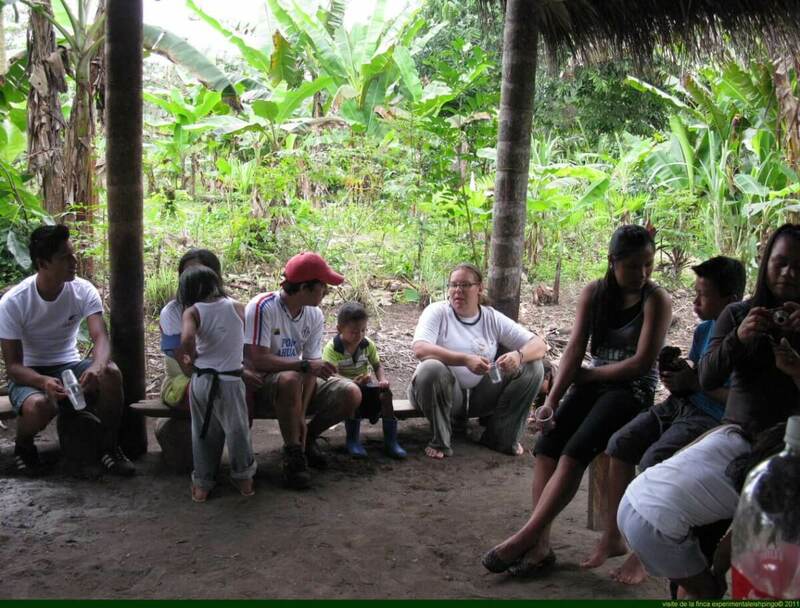 Flore is performing a formation to a group of kichwa farmers. 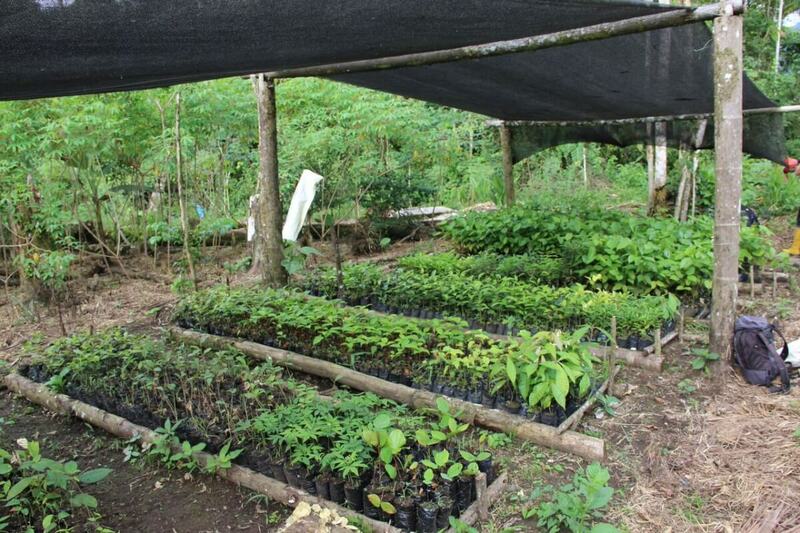 Using tree nurseries allows to ensure that the trees that are going to be planted will be strong and healthy. 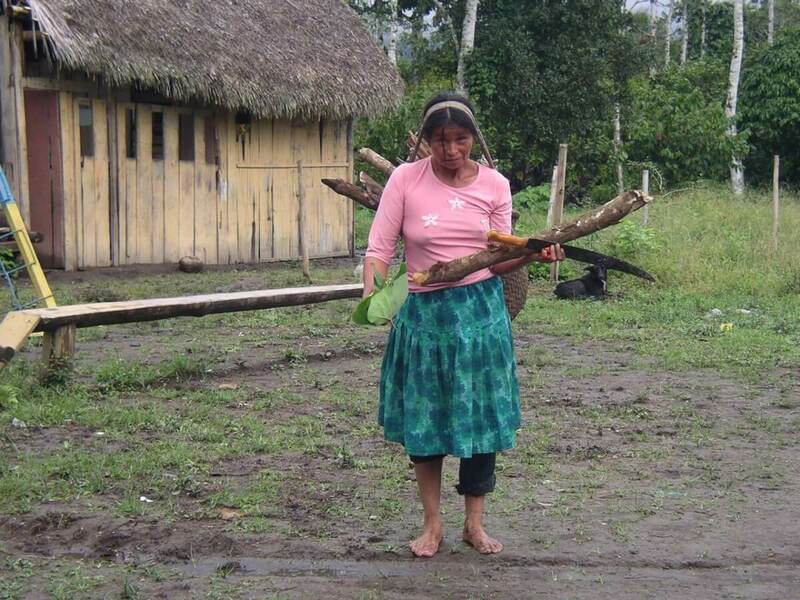 Kichwa women, tough and strong, are excellent workers. 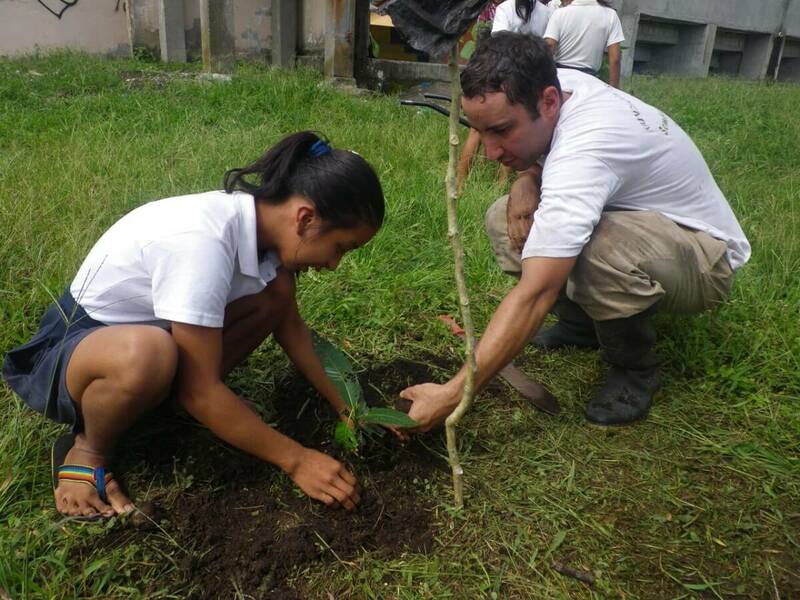 Antoine is explaining to a school kid how to properly plant her young shoot. 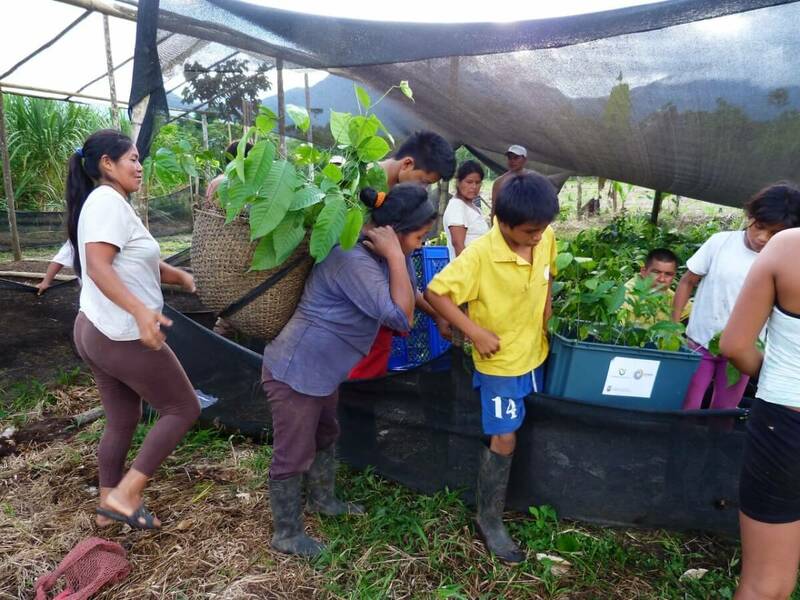 A kichwa reforestation team gets a tree load. 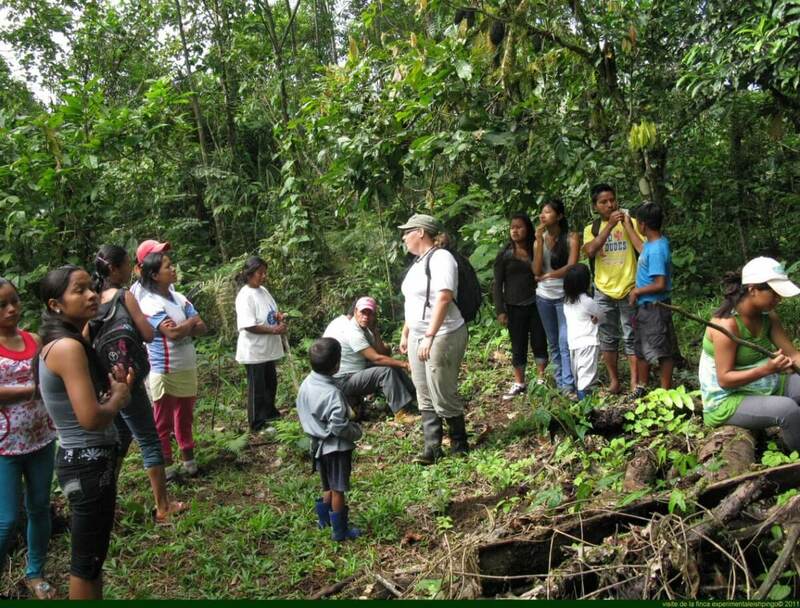 Every year volunteers from all countries join us to help us on the field. 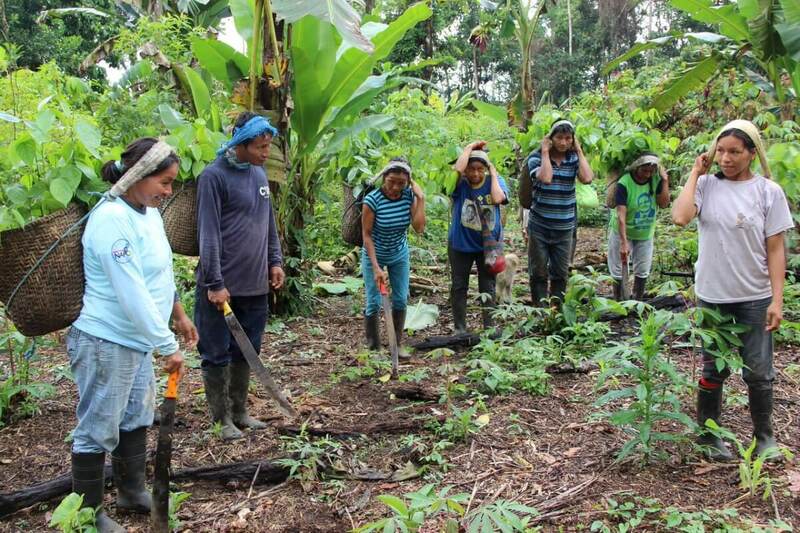 Kichwa communities work as teams in order to be more efficient. 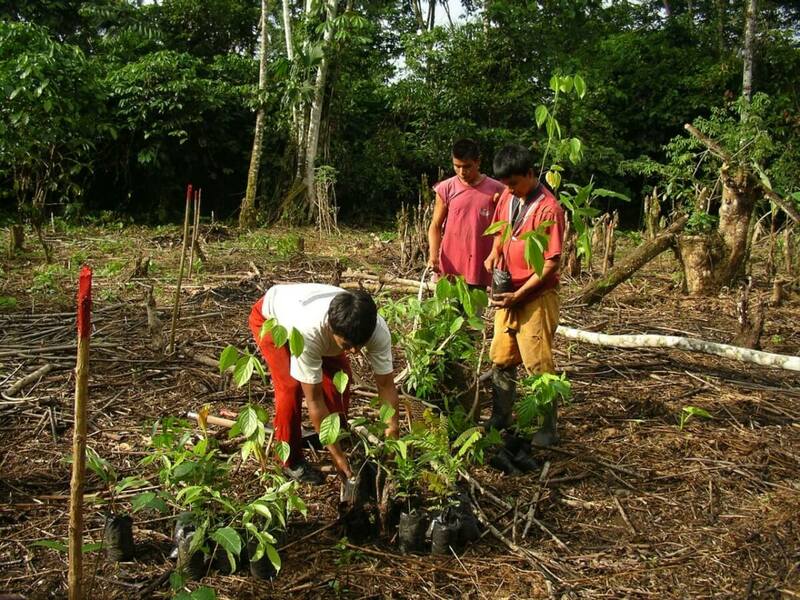 This team is bringing young trees to a plot into the forest. 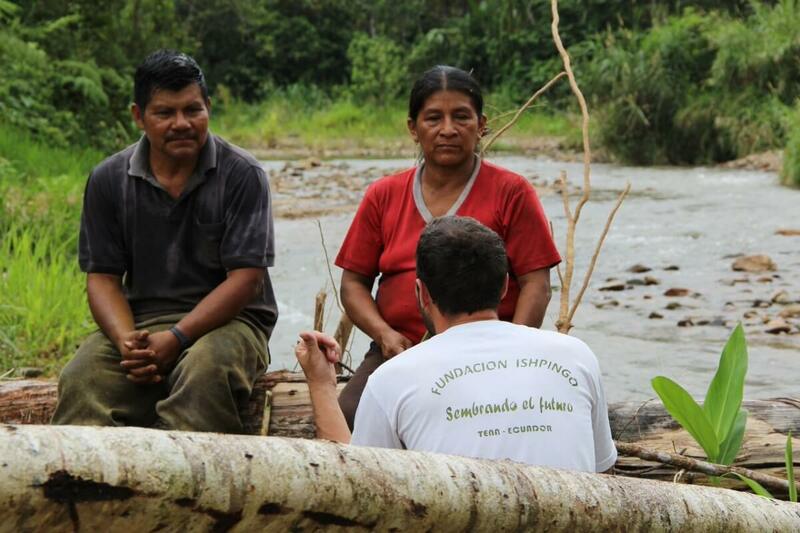 Local population commitment is the key to the succes of our reforestation projects. 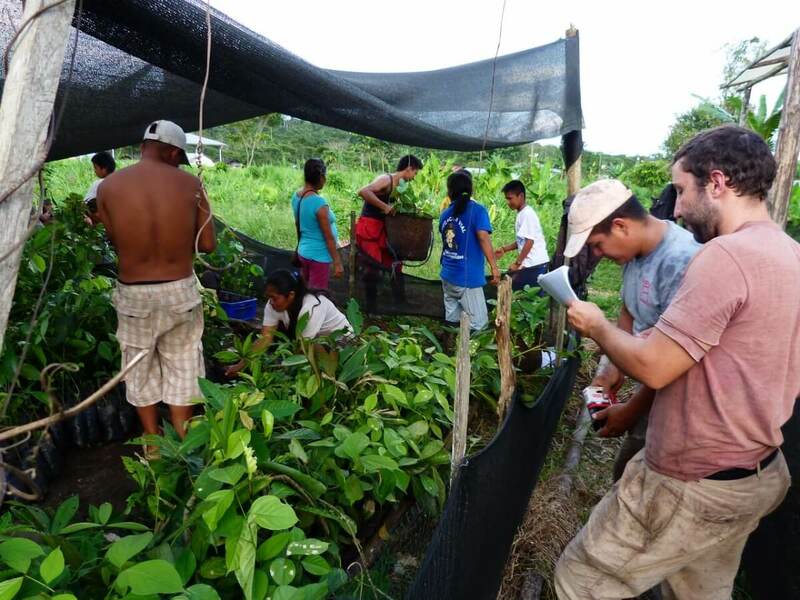 Antoine is distributing trees between several different farmers. 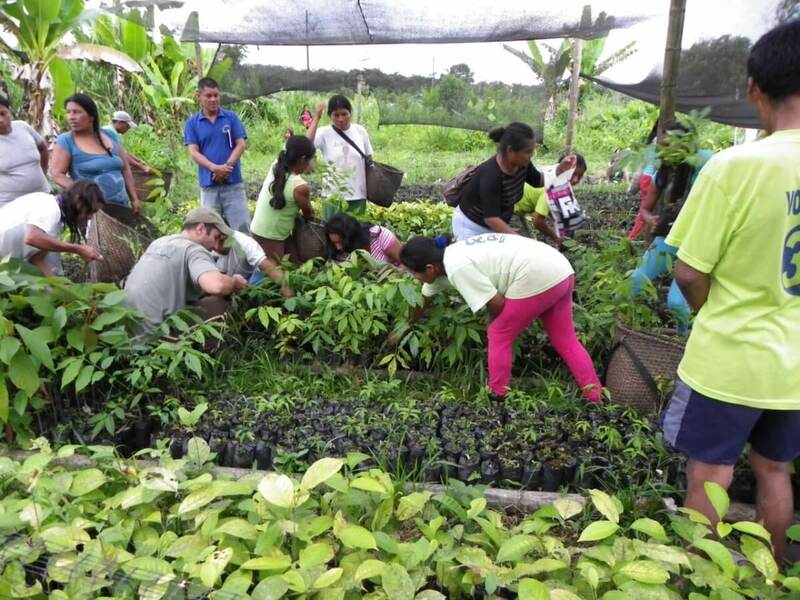 Reforestation begins within tree nurseries. 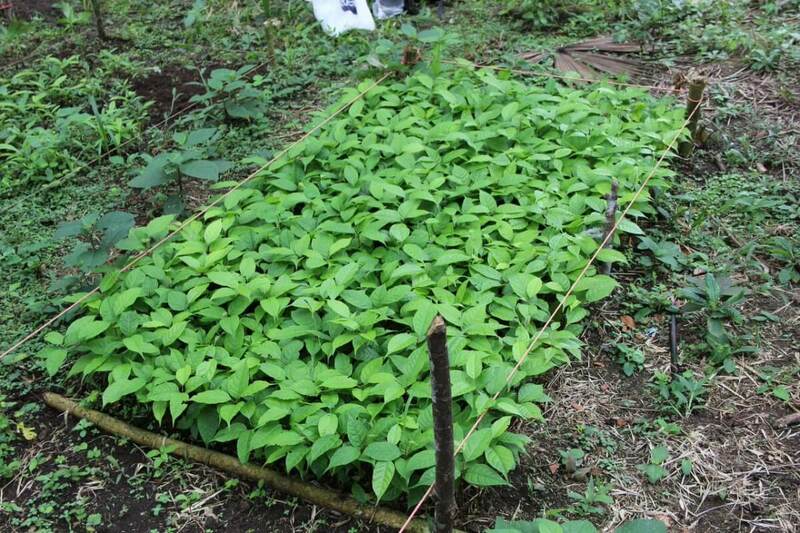 It's necessary to prepare the young shoots before transporting them. 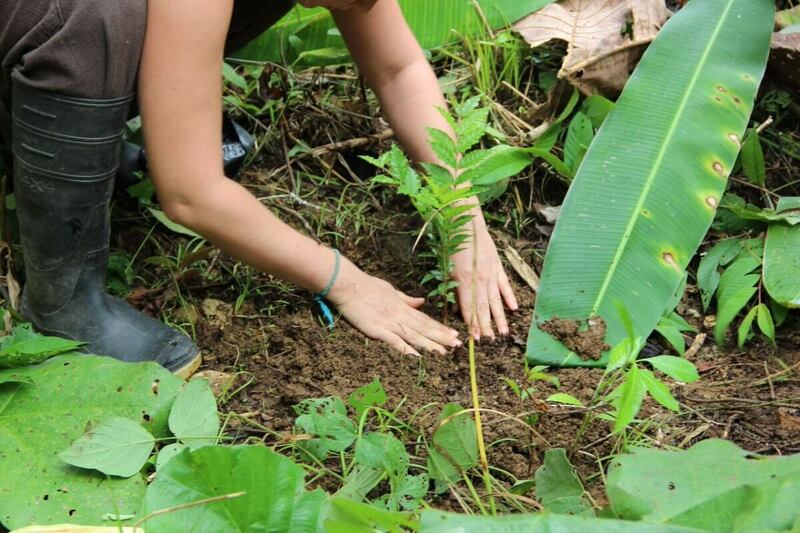 Two young girls are transplanting a tree. The plots are carefully delineated. 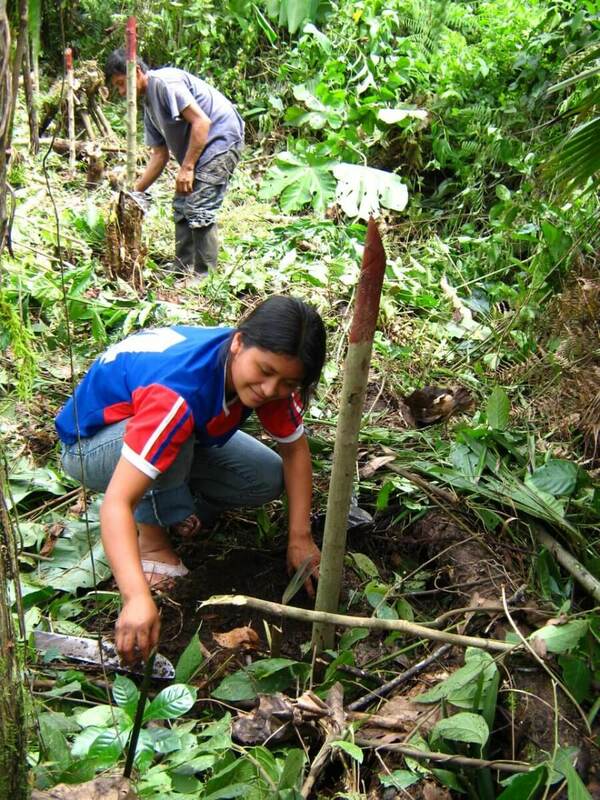 This young kichwa woman is identifying the location where the trees have to be planted. 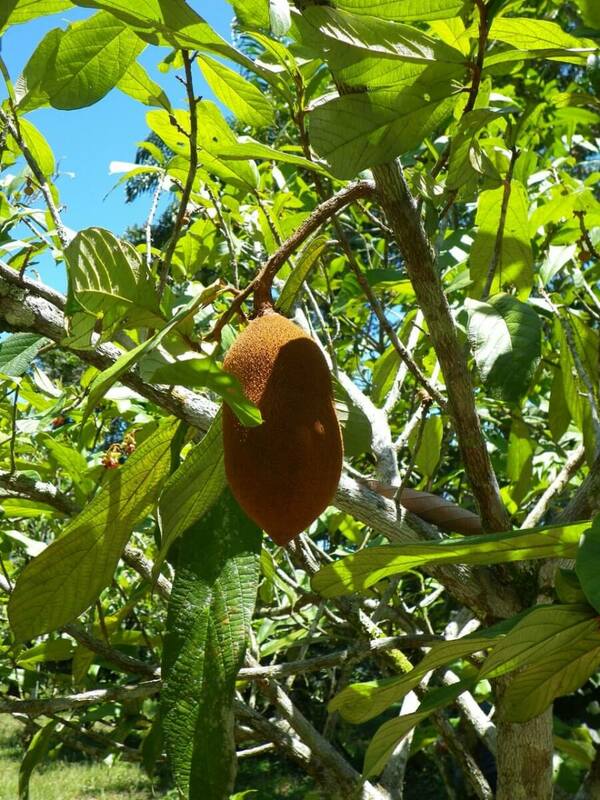 This fruit is too acid to be eaten unless you transform it in jam. 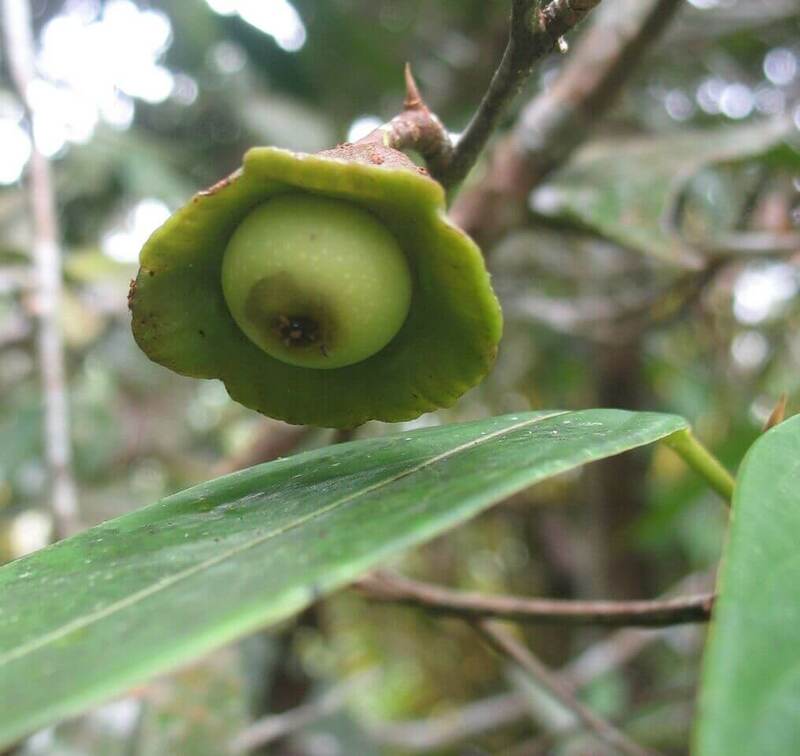 Bilimbis cluster on a tree. 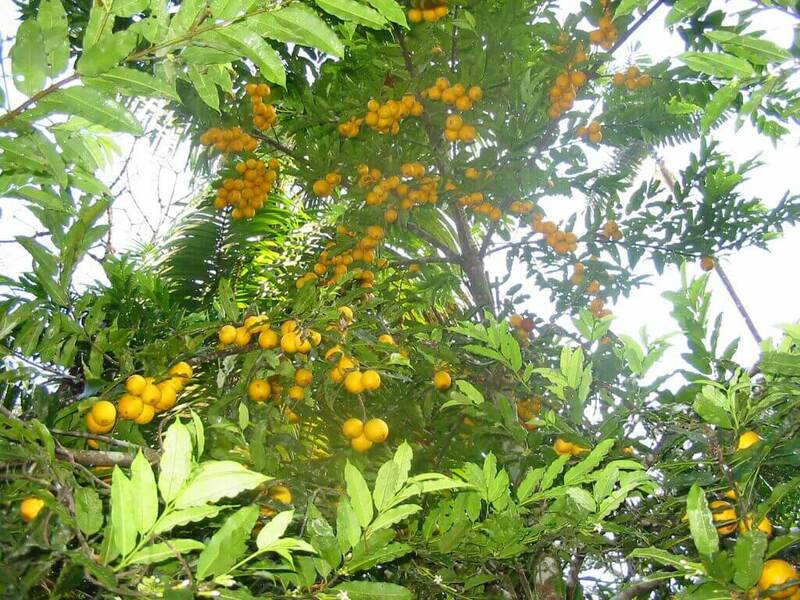 Borojos, being naturally rich in amino acids and minerals, are well known as a powerful antioxidant. 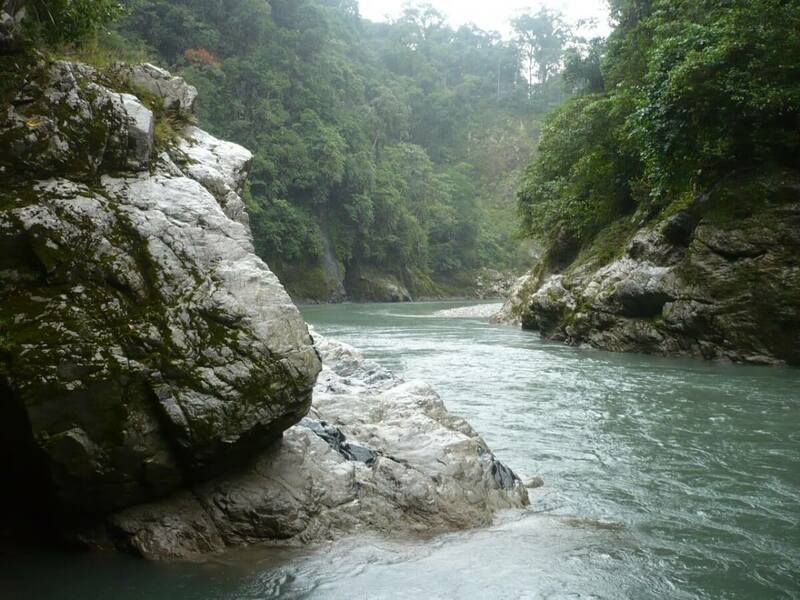 The symbol of our foundation called ishpingo in kichwa language. 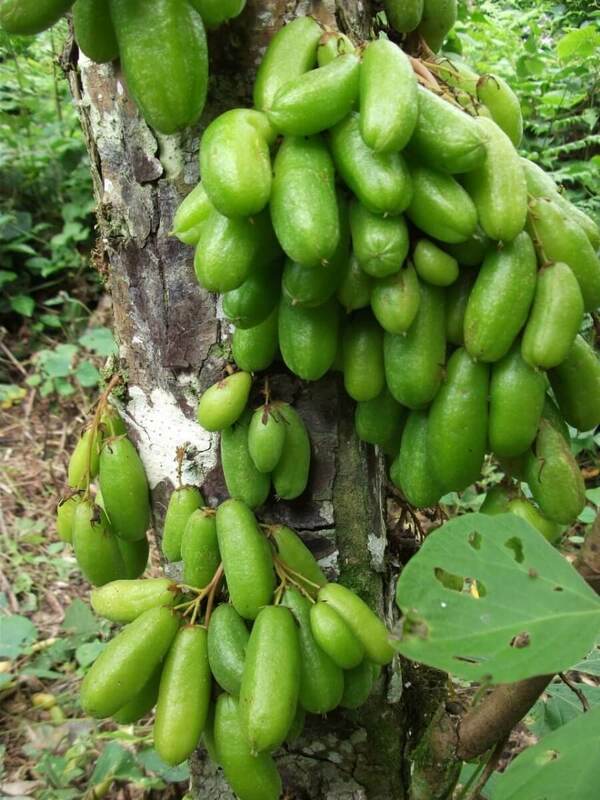 This tree is cultivated for its natural rubber and its fruit that looks like prune. 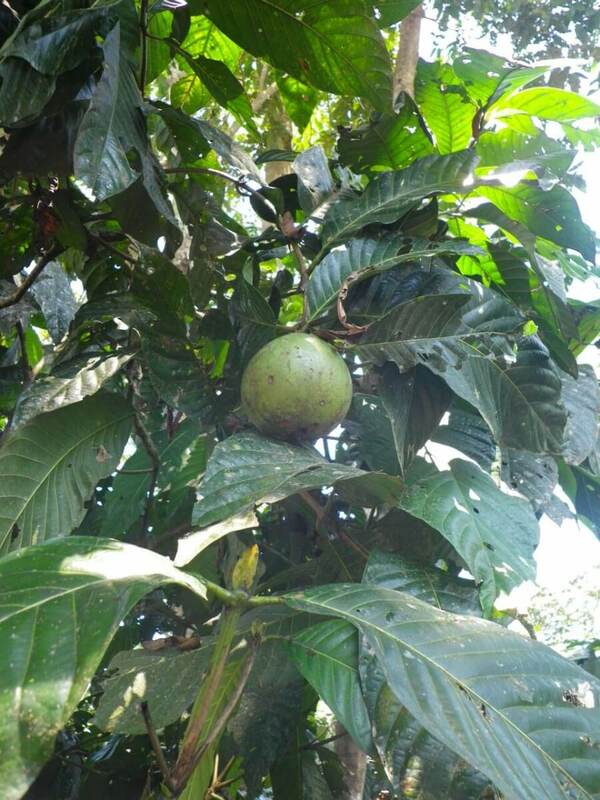 The Cherimoya is a fruit that tastes like custard apple. 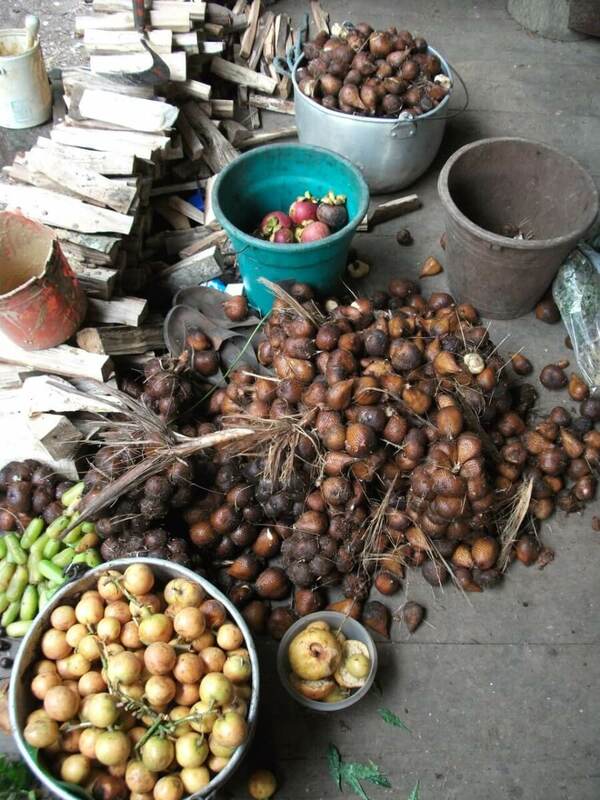 Close to cocoa tree, the Cupuaçu comes from the South-East of the Amazon bassin. 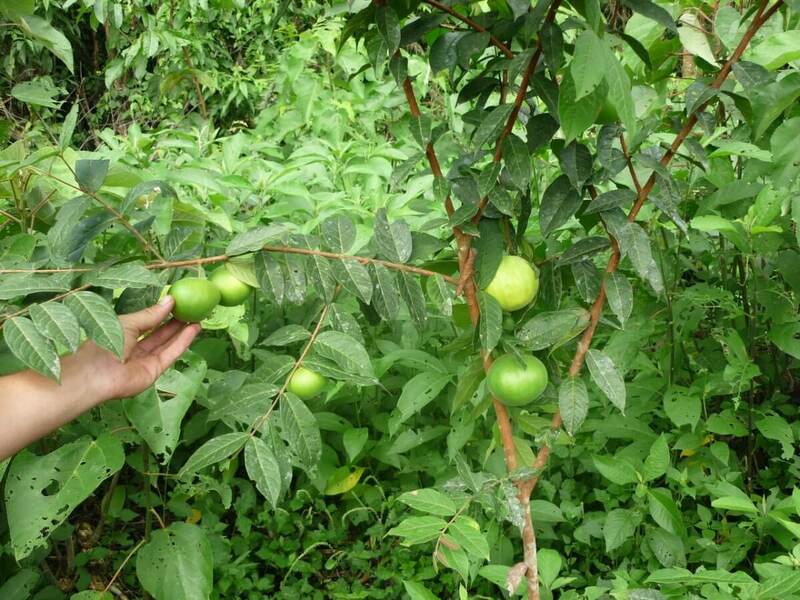 A kichwa woman is selecting some guavas. 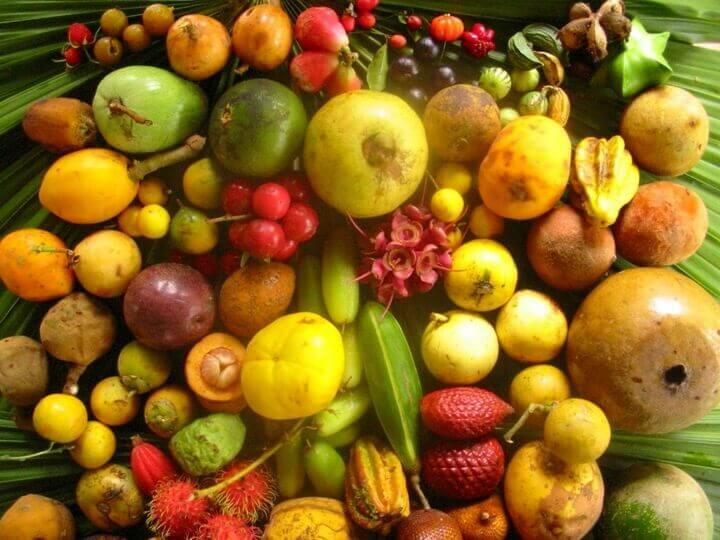 The Jack-fruit, close to fig, comes from South-East Asia. 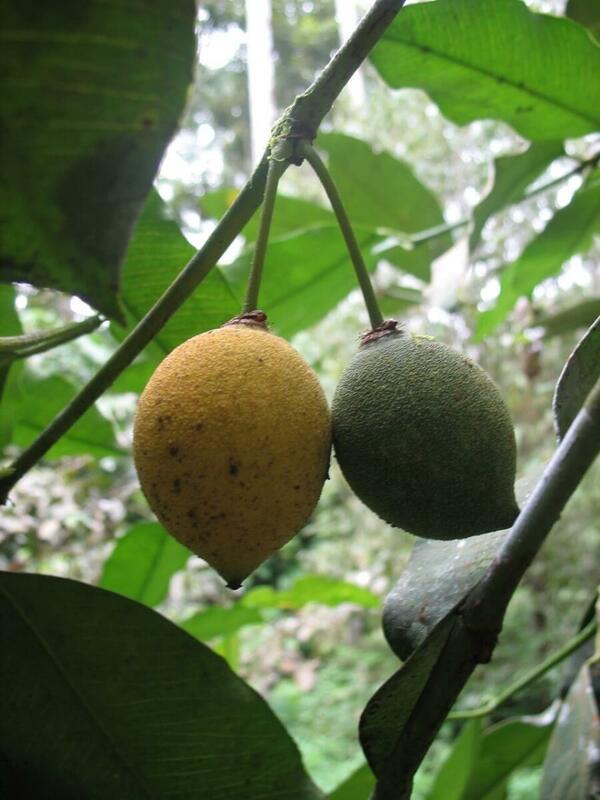 The madrono is a typical fruit tree of the Amazon rainforest. 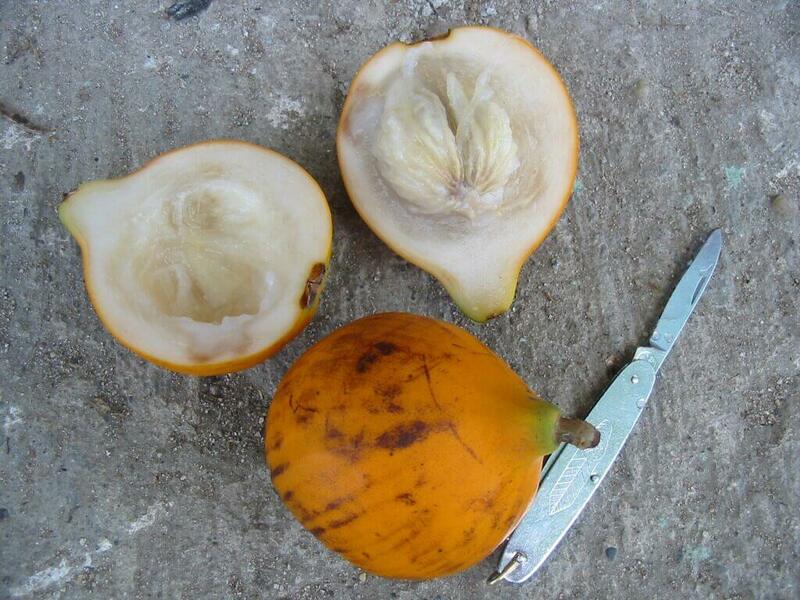 Cross section of a mulchi. 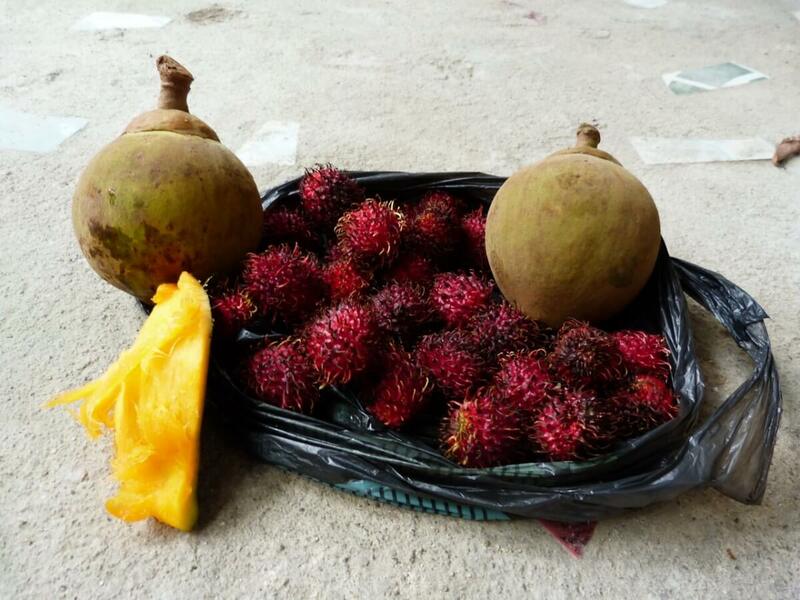 The ramboutan is a red hairy fruit whose heart is edible and looks like litchi. 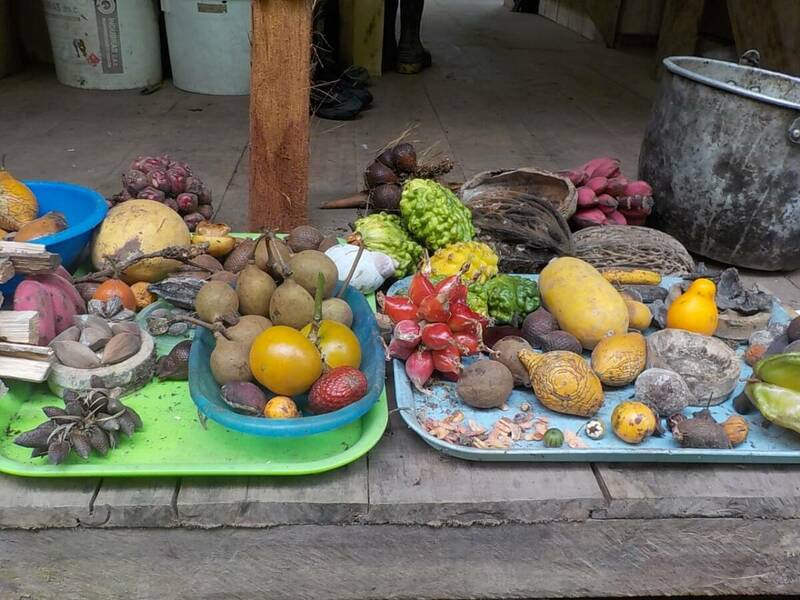 A pretty decent harvest that is going to be sold. 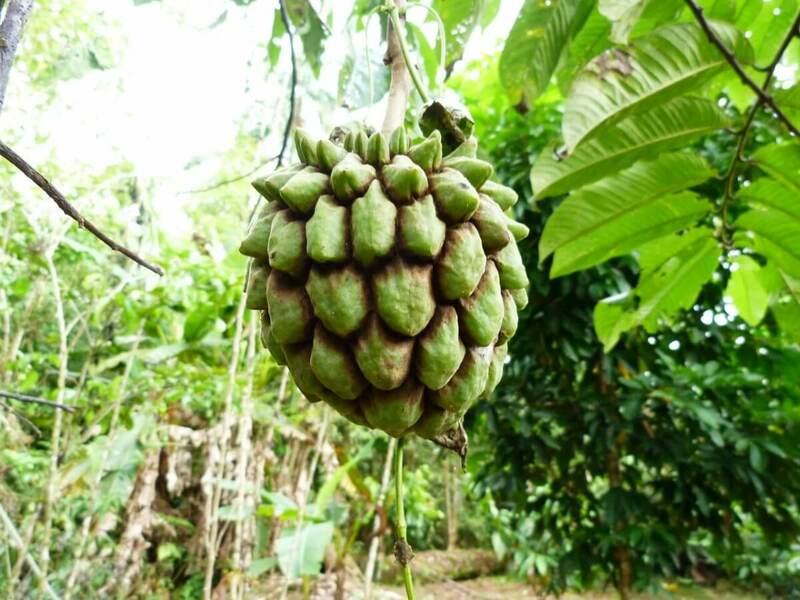 This fruit coming from asia is delicious but fiercely defended. 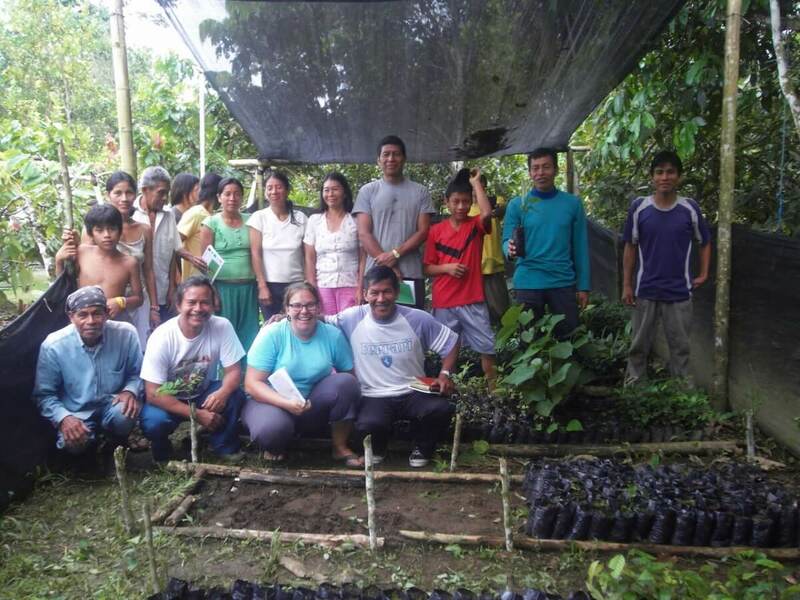 Planting fruit trees improves and diversifies the feeding of local populations. 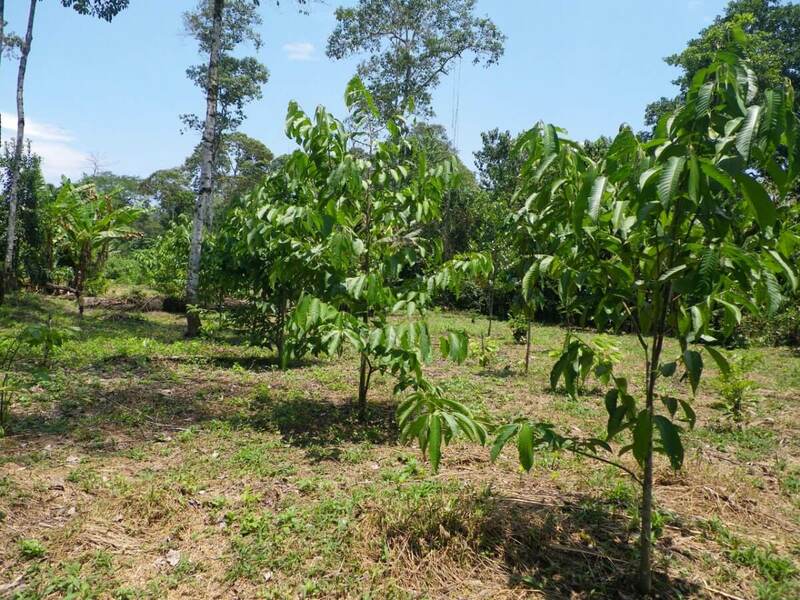 The tree nursery comprises small delineated plots in order to easily identify the young shoots kind. 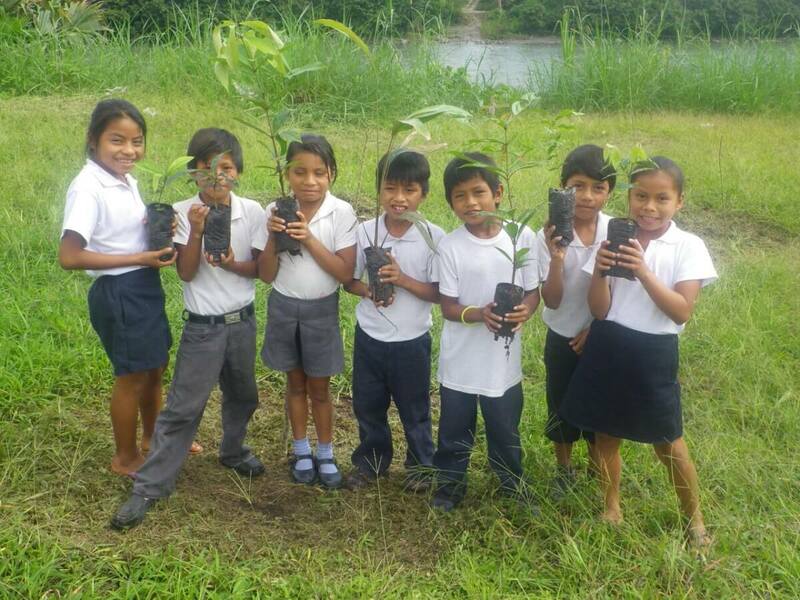 This reforestation team is collecting young trees which are going to get transported and replanted. 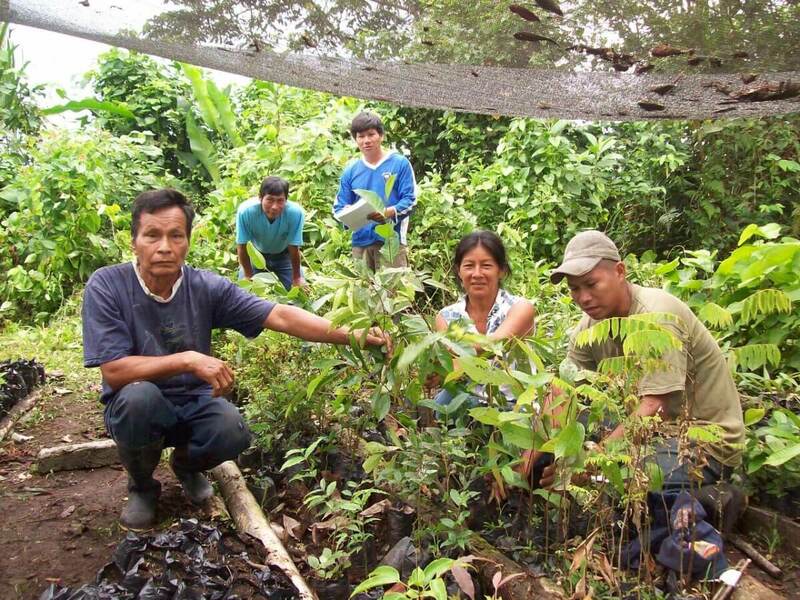 Farmers who practice reforestation alongside with Ishpingo are posing in the tree nursery. 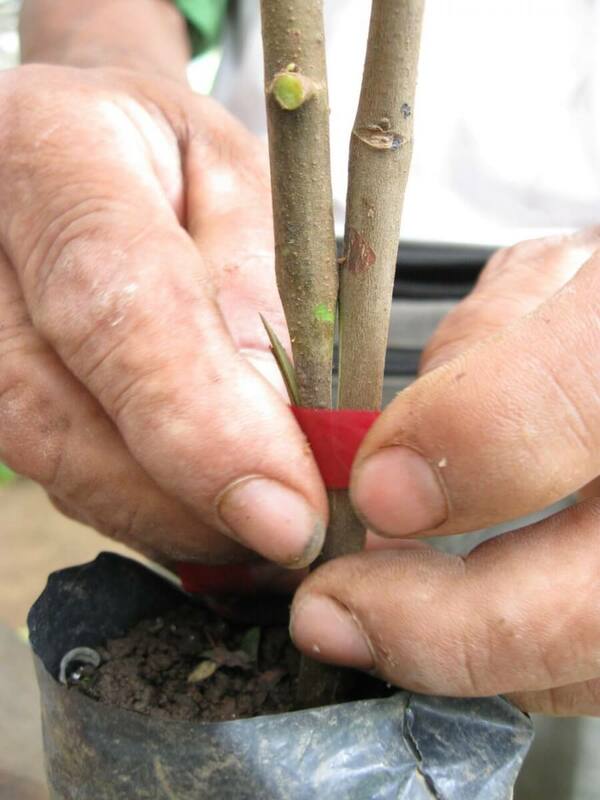 Grafting citrus allows to get small, tough and fruitful trees all at once. 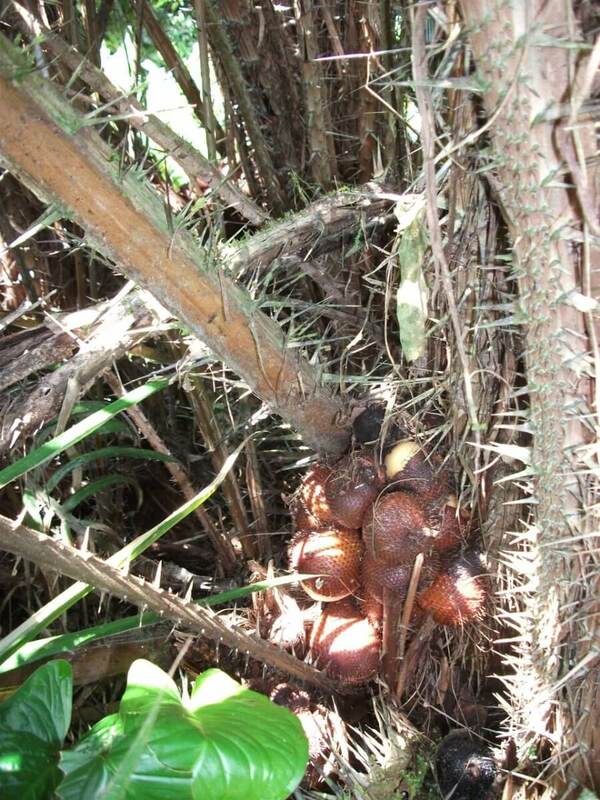 A young and vigorous plant is growing within the tree nursery. 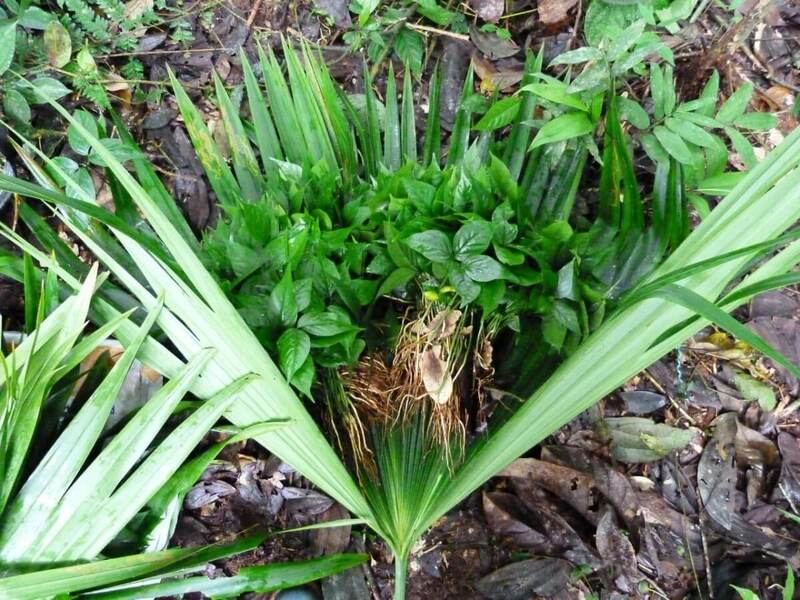 Young shoots emerging through the soil are protected by a mulch made of leaves and bark. 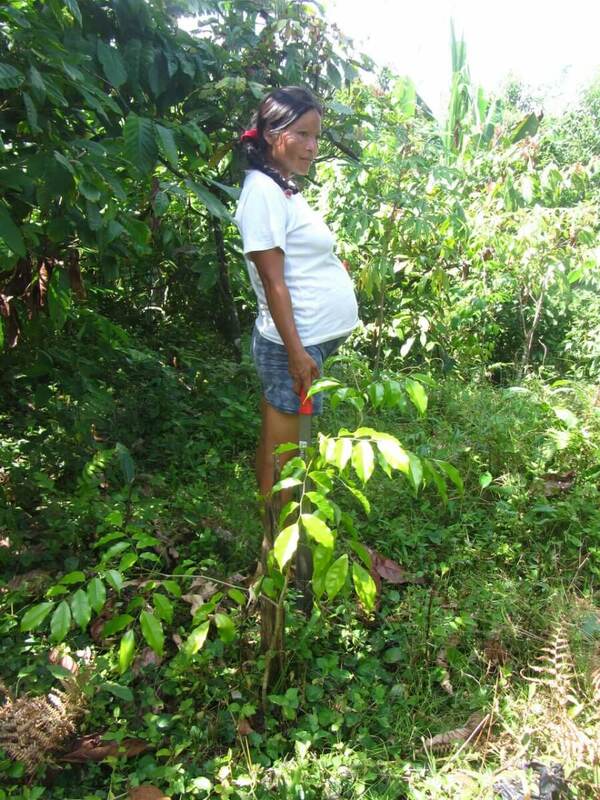 A kichwa woman is checking the young trees to spot potential diceases or parasites. 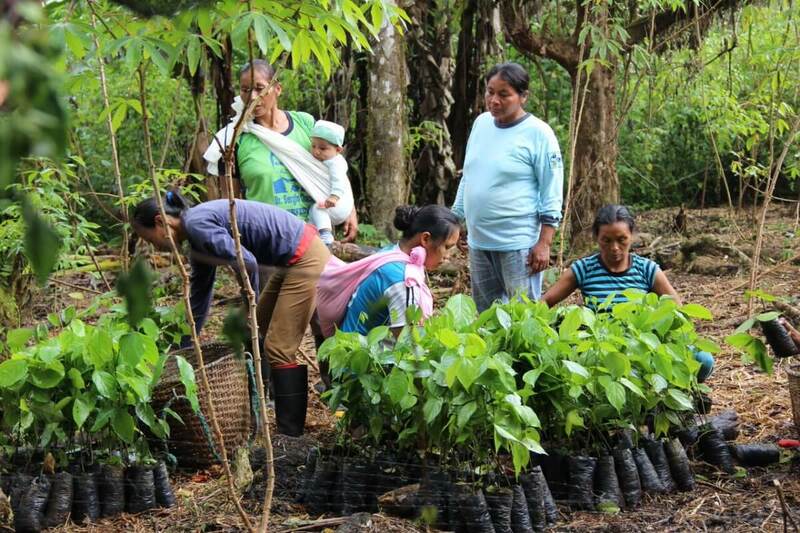 Kichwa farmers are selecting young trees in the tree nursery. 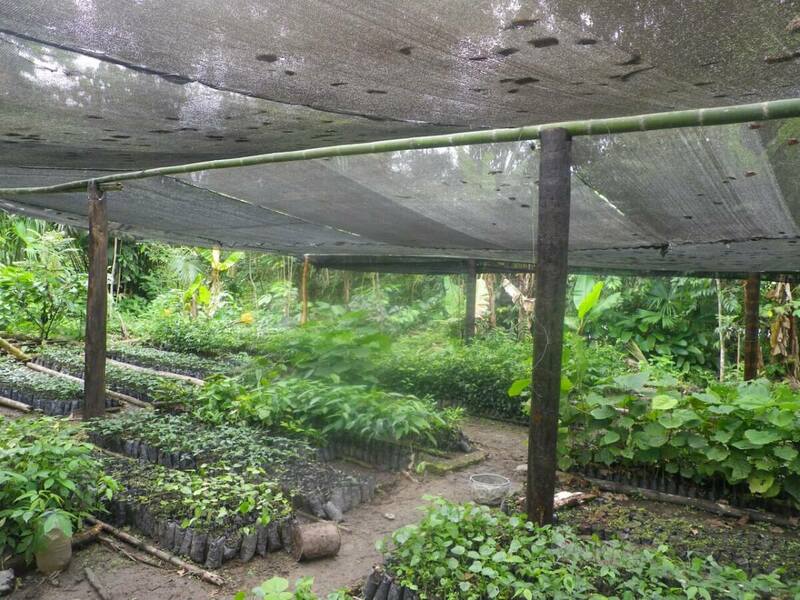 An overview of Ishpingo's tree nursery hosting multiple different species. 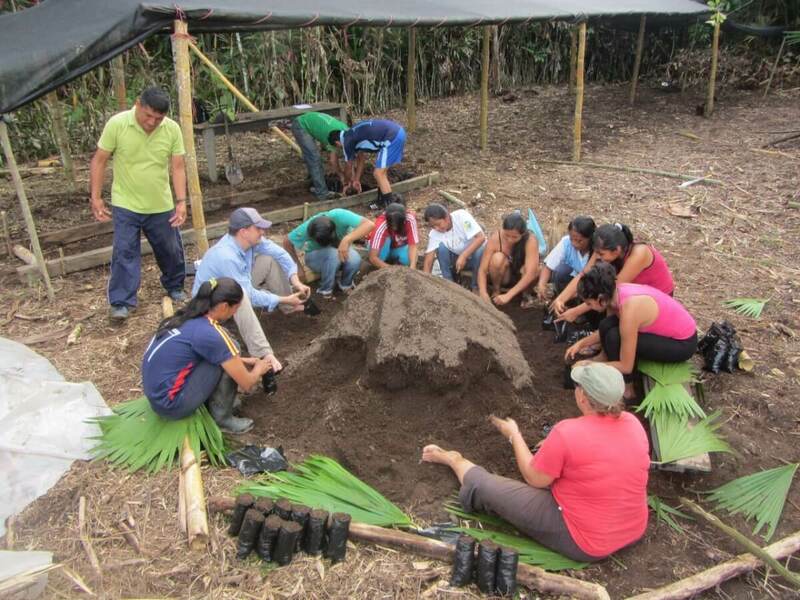 This reforestation team is preparing the soil that is going to be used to fill temporary pots. 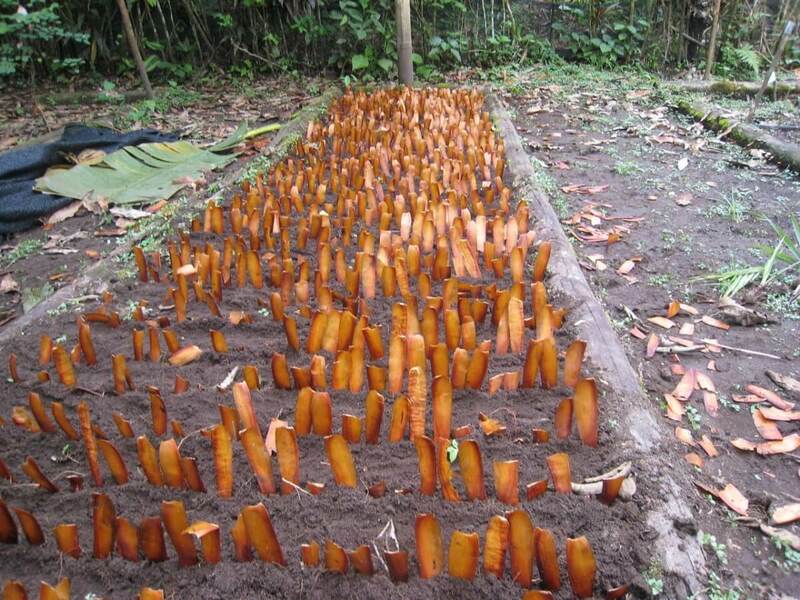 We use piece of bark to delineate seedling areas. 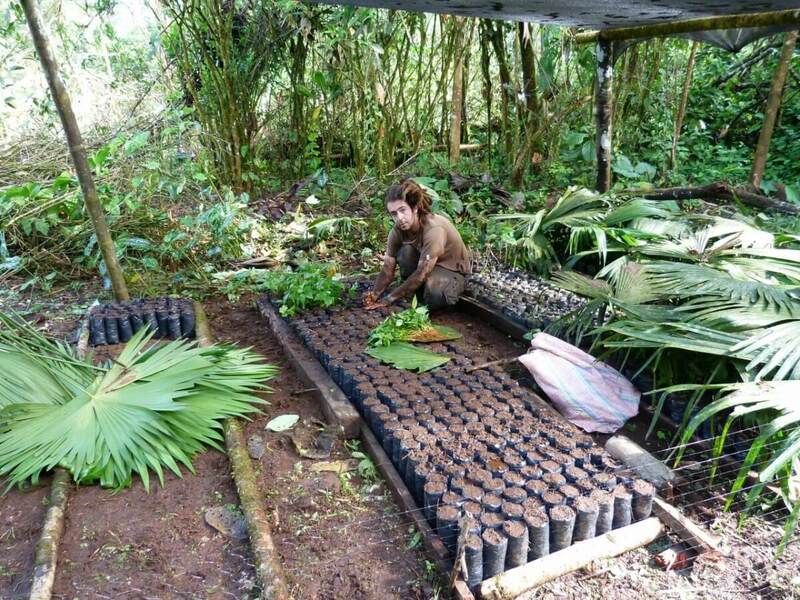 A volunteer is preparing some pots that are going to be used to maintain trees alive during transportation. 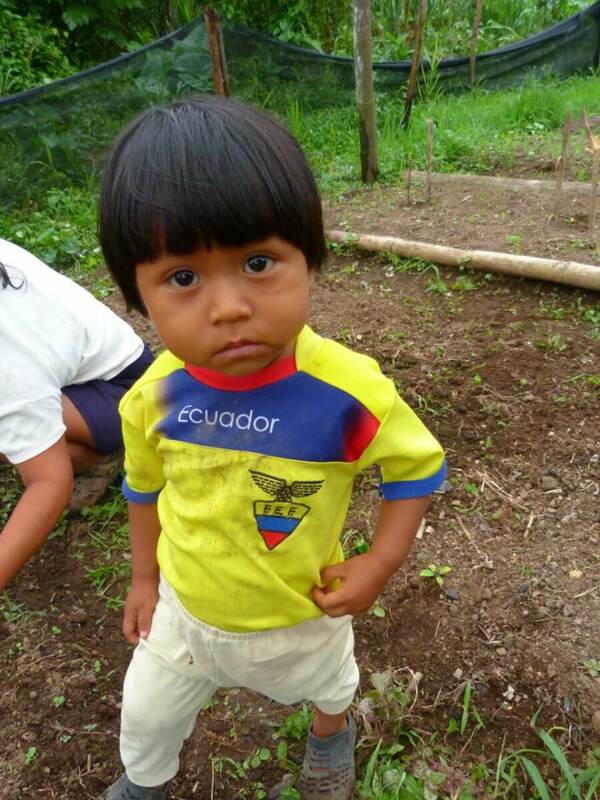 A little child wearing the Ecuadorian football team jersey. 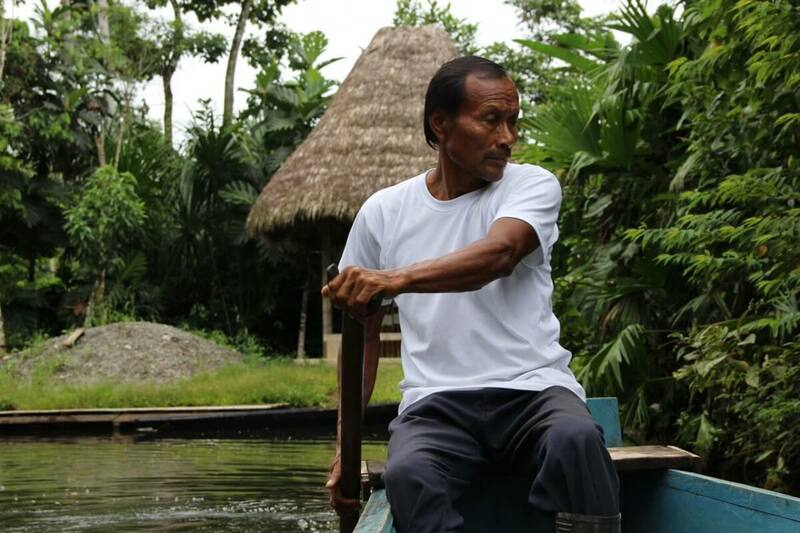 The owner of the Paicawe lagoon is navigating in his pirogue. This man is wearing a bandana to protect his head from the scorching sun. 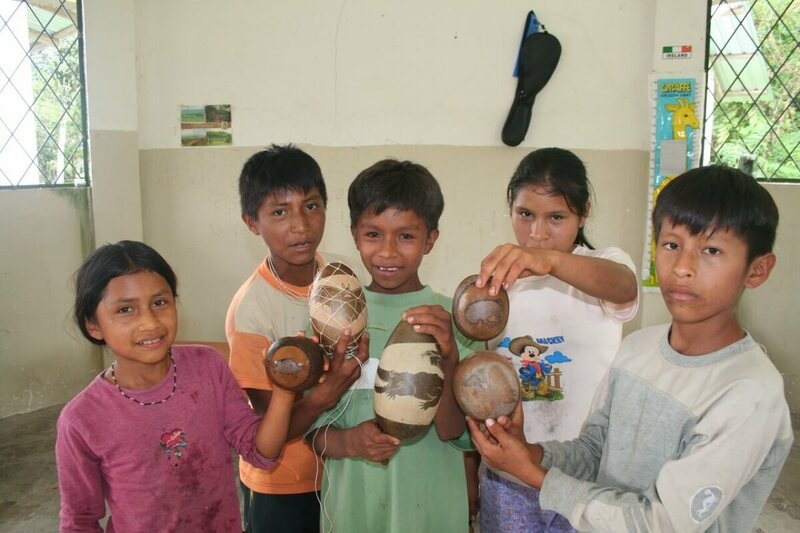 Kichwas also make money by trading local craft. 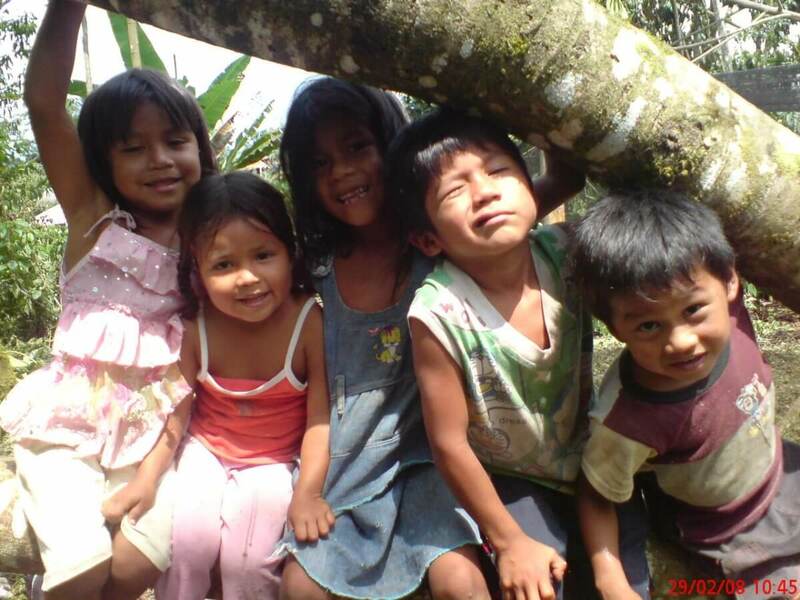 Kichwa children pose in the shade of a big trunk. 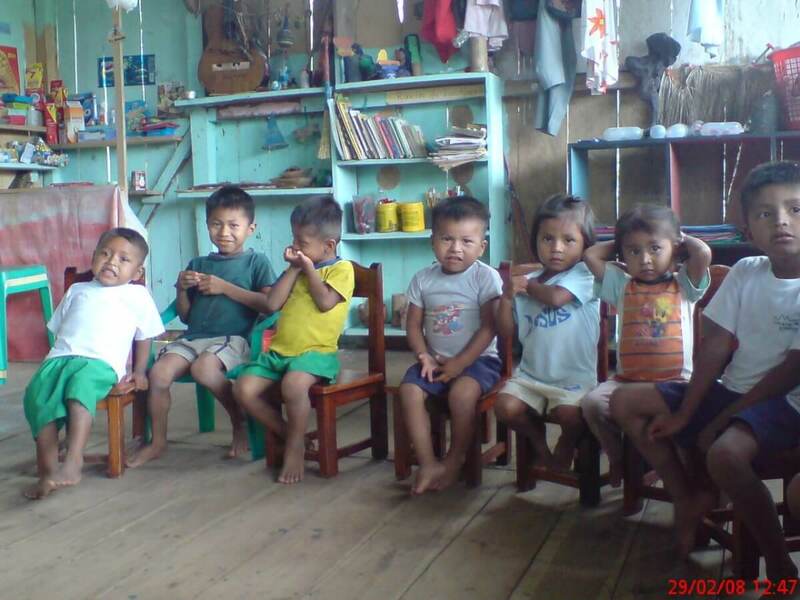 Training course for those young children. 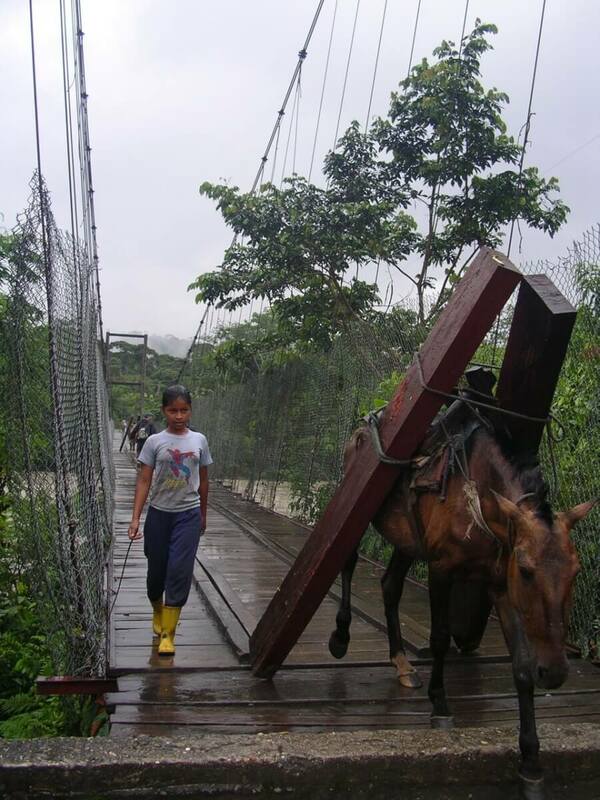 This girl is leading her horse which is carrying two large wooden beams. This woman is expecting a happy event. Nevertheless that does not stop her to do work on the field. 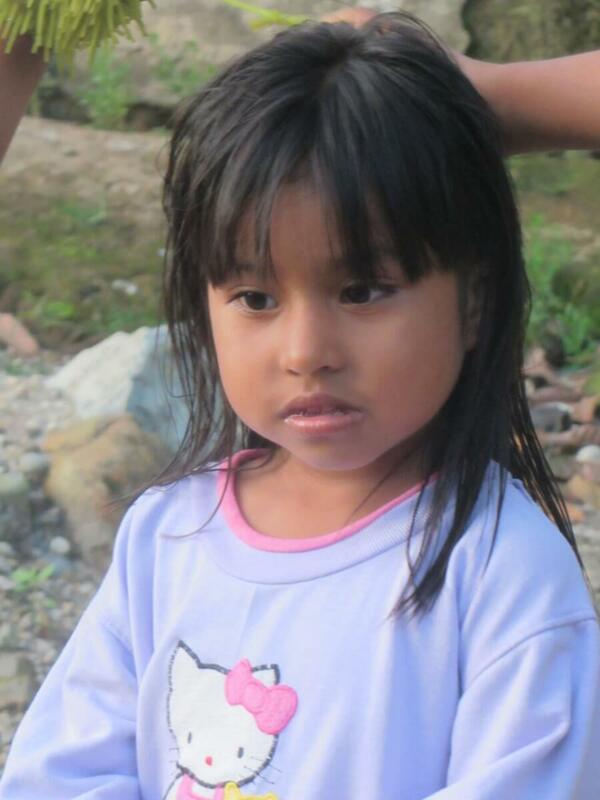 Young kichwas wear occidental style clothes nowadays. 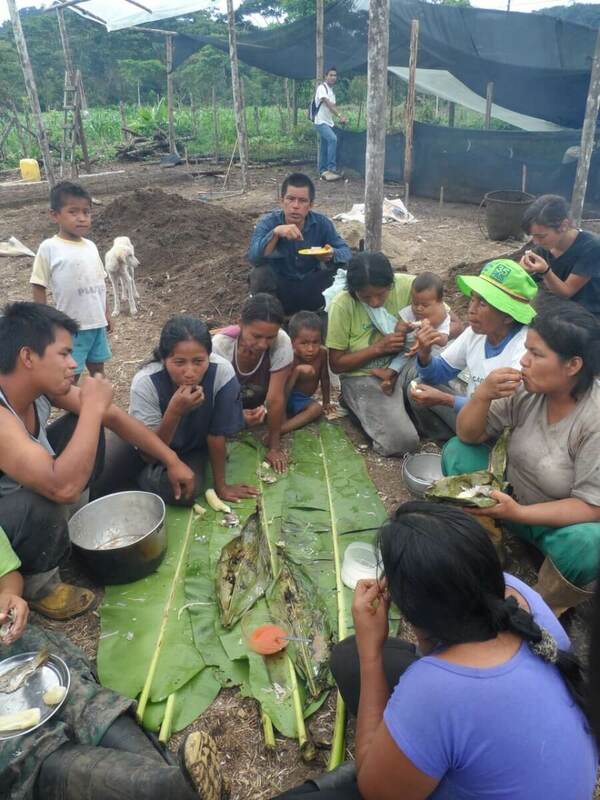 Meals are taken together, this is a moment of rest and share. 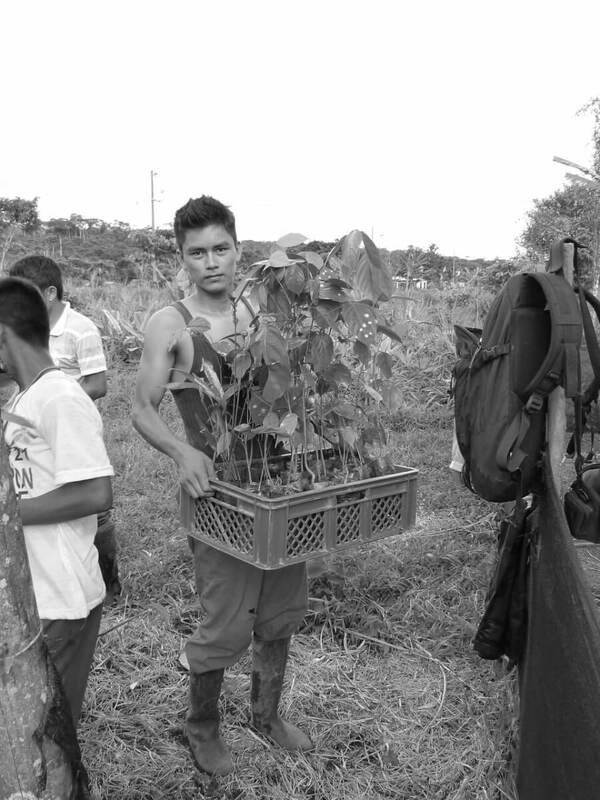 Young man in his prime about to replant trees on his plot. 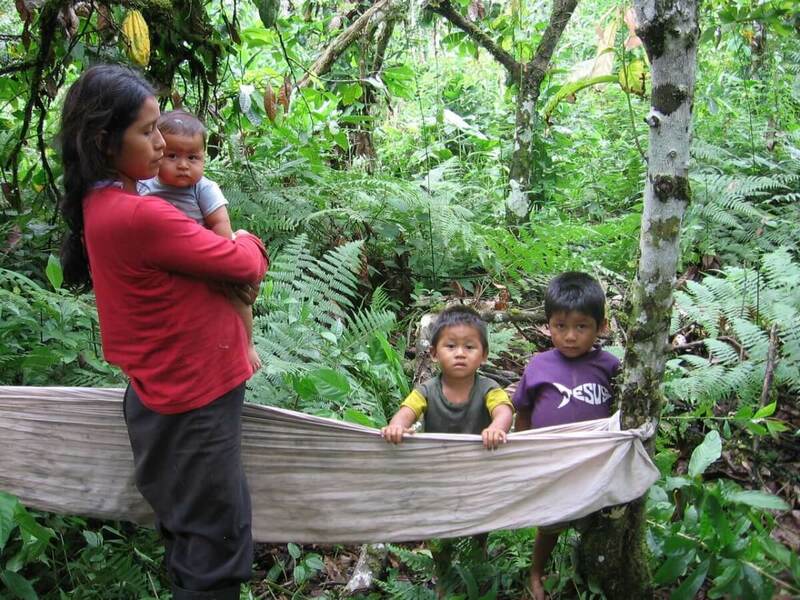 Symbol of South America, hammock is used even by the youngest. 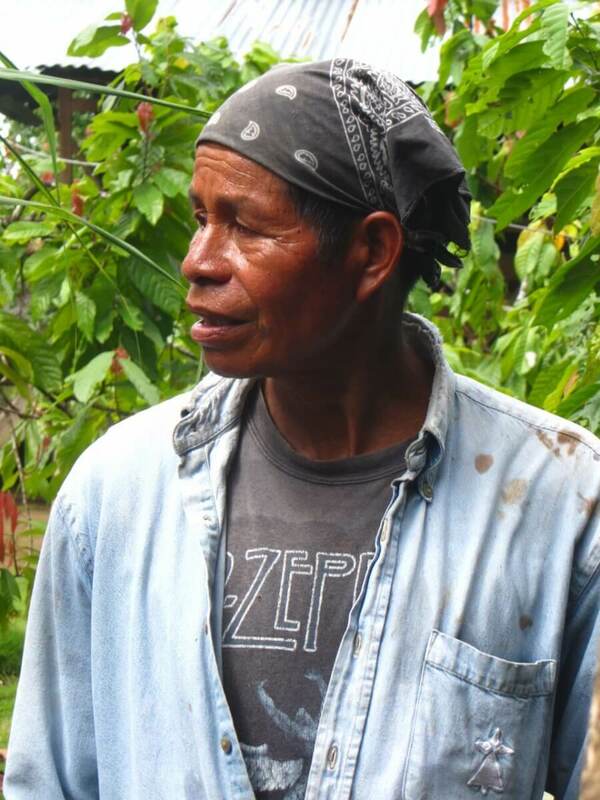 Angel ALVARADO is called "El Profesor" because he has developed an outstanding botanical knowledge. 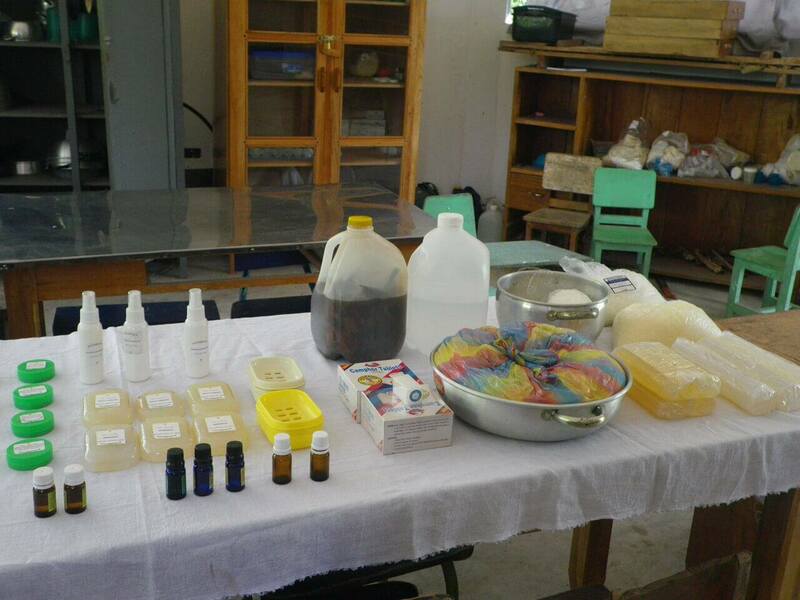 Work is about to begin in the traditional medicine laboratory. 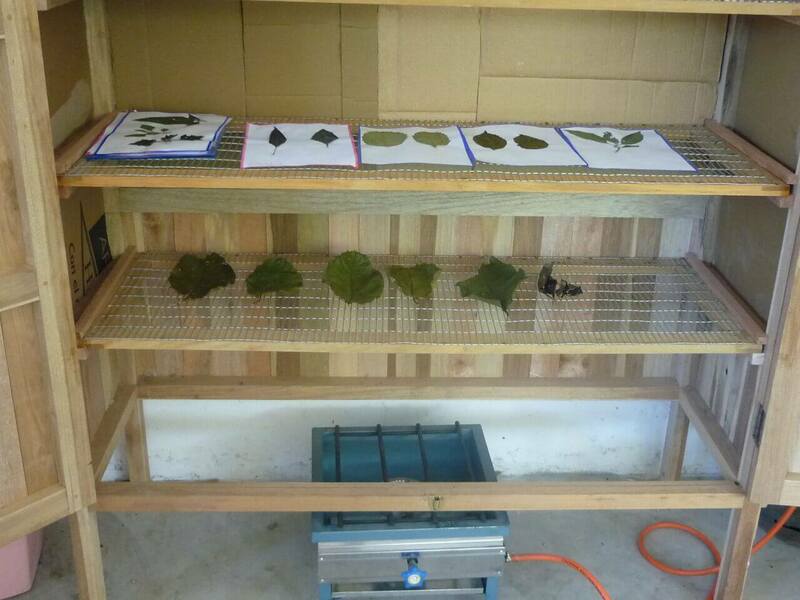 The different kind of medicinal leaves are preserved wihtin an educational herbarium. 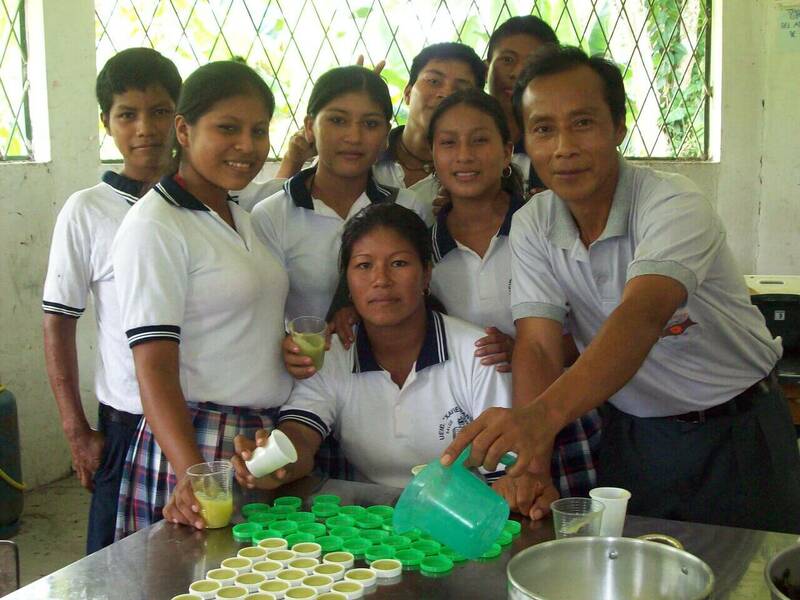 El Profesor teaches botany and traditional medicine at Tena high school. 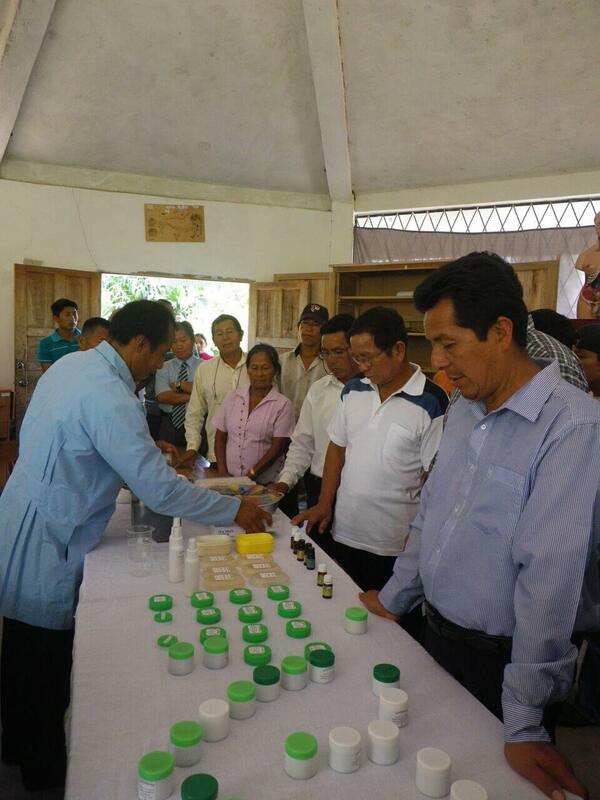 Brewed remedies are going to be marketed thus having a positive impact on local populations living conditions. 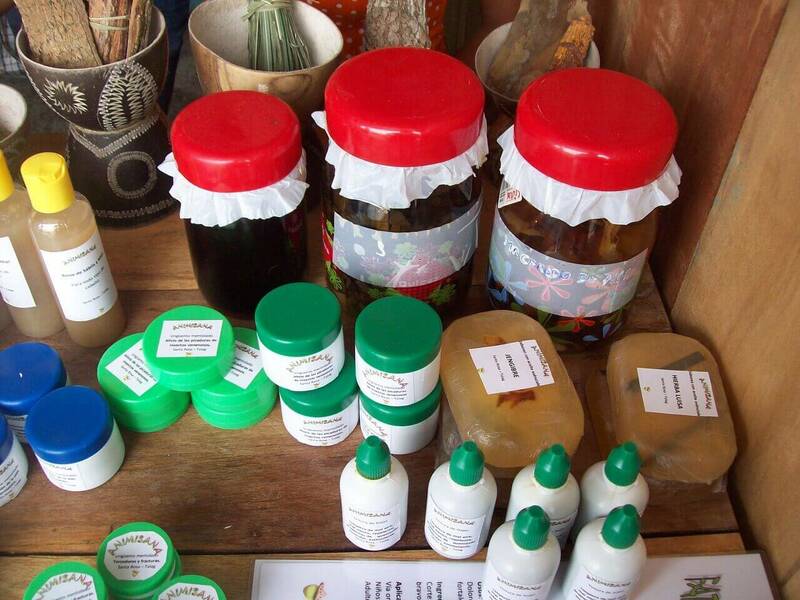 An overview of the traditional remedies made within Ishpingo's laboratory. 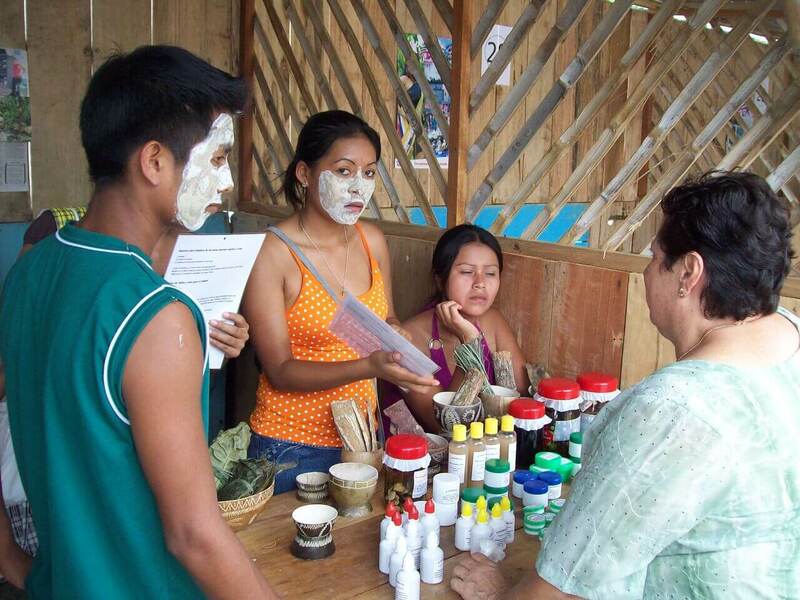 The remedies are sold as fairtrade to local populations. 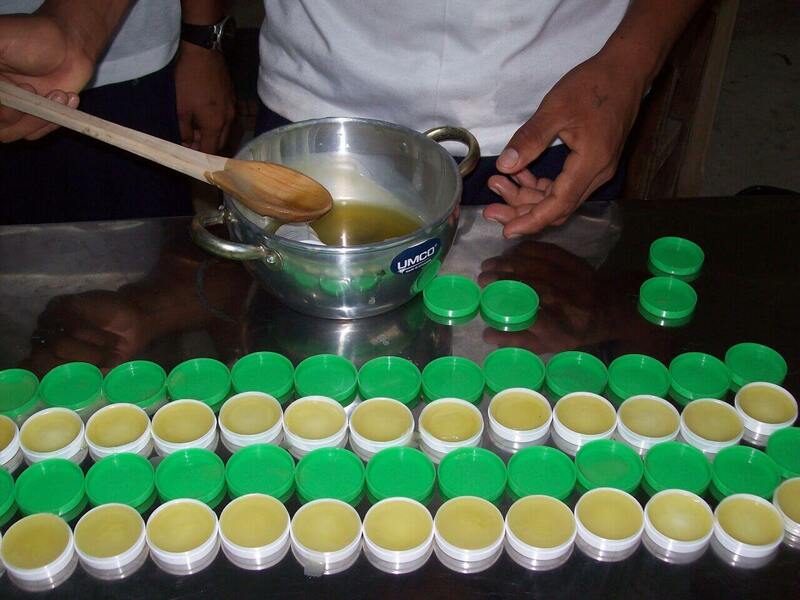 Local populations are invited to test traditional remedies. 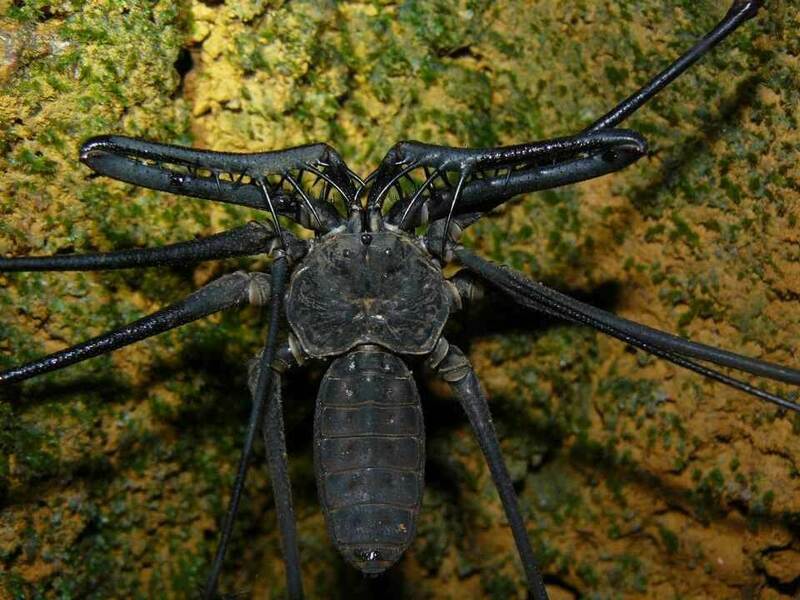 This nocturnal arachnid has oral pedipalps it can uses as pincers. 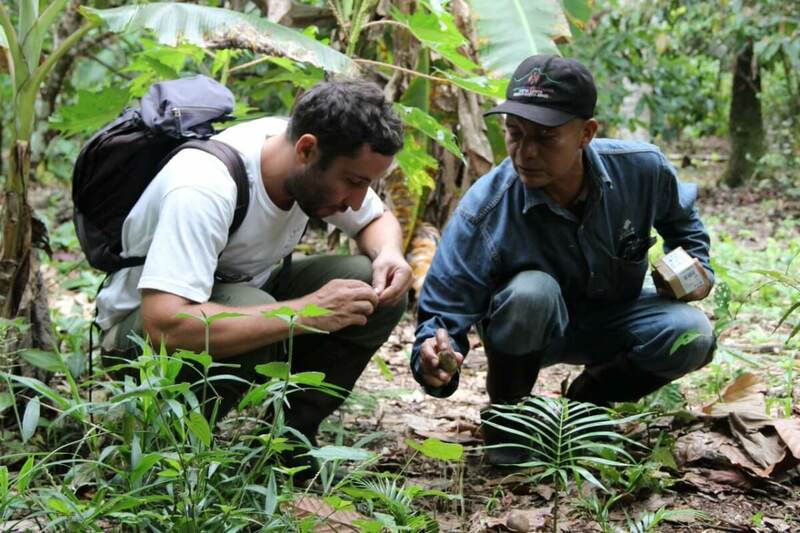 Those arthropods haven't evolved for 365 millions years. 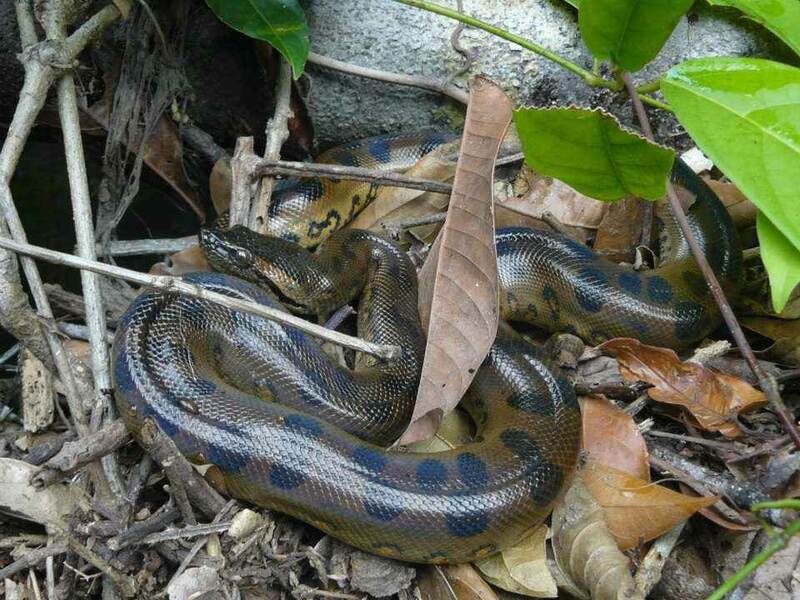 Anacondas are half aquatic constrictor snakes that can weight more than 200 kilos. 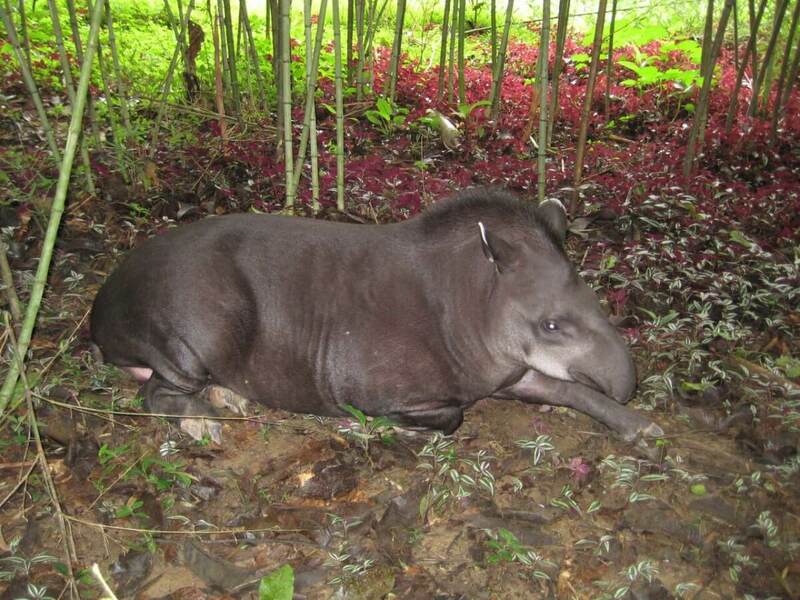 This small animal has a bony shell and eats insects and berries felt on the floor. 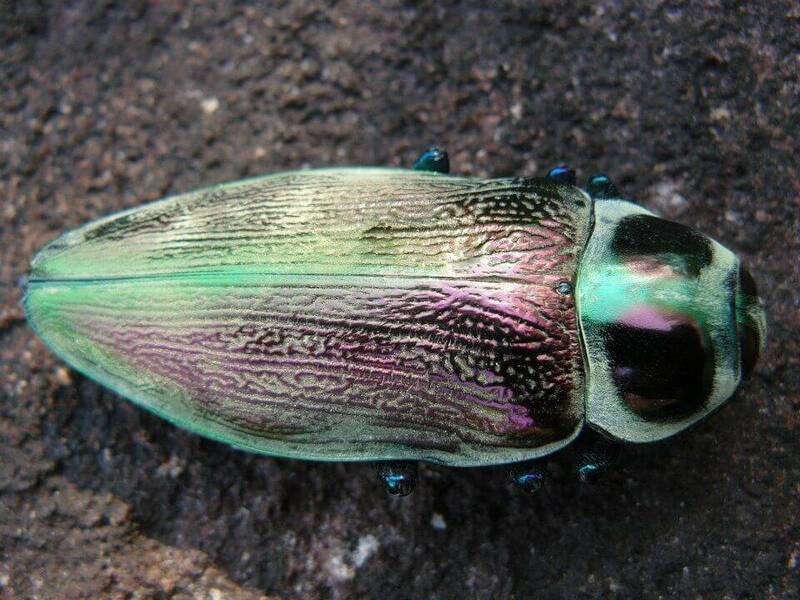 A splendid and brigth specimen of Amazon beetle. 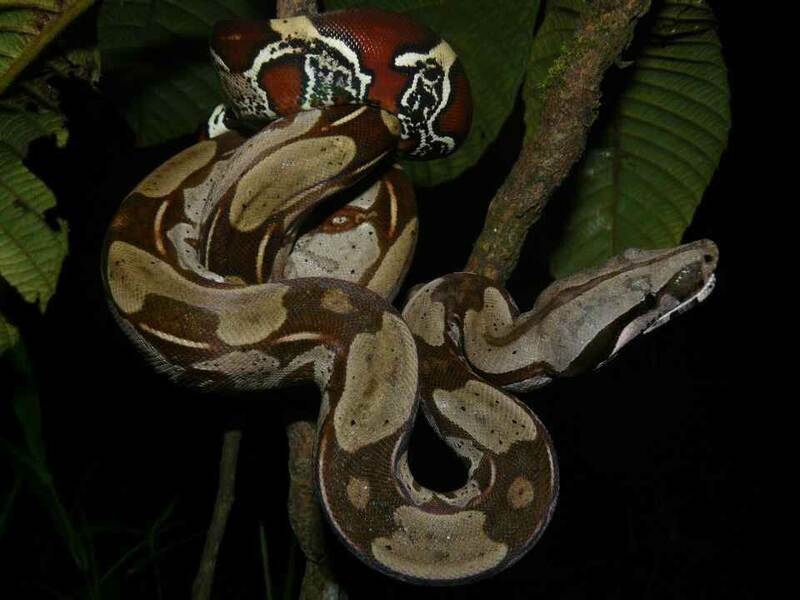 Boa constrictor is carnivore snake easily recognizable by the typical color of its tail. 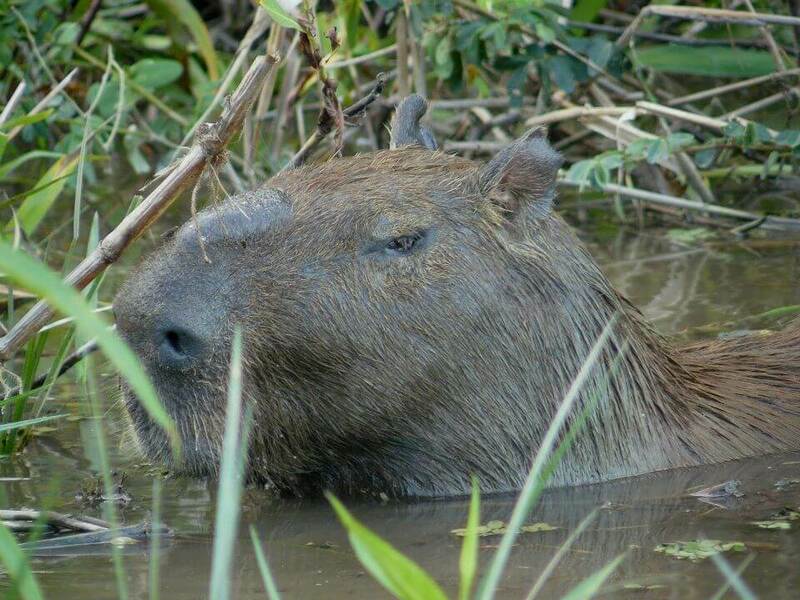 This half aquatic mammal is the largest rodent in the whole world. 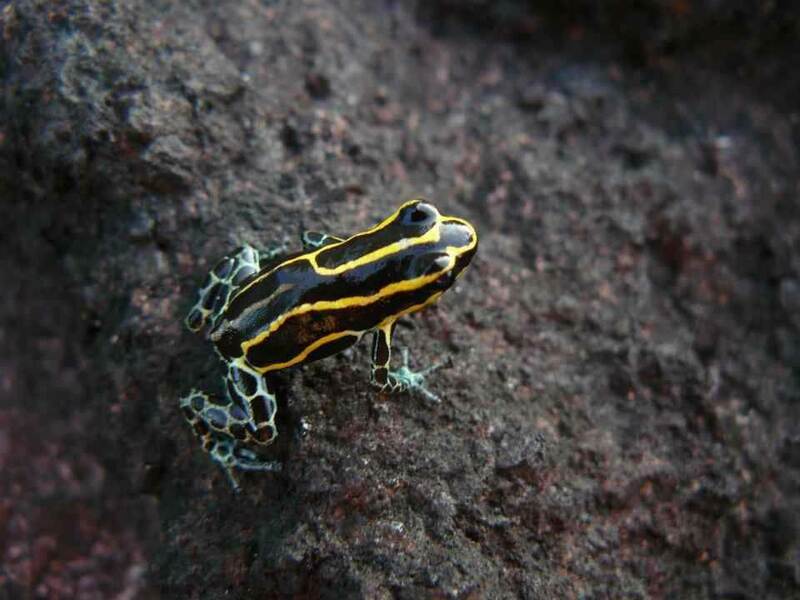 This small amphibian is famous for the toxin it secretes and which can be letal for some species. 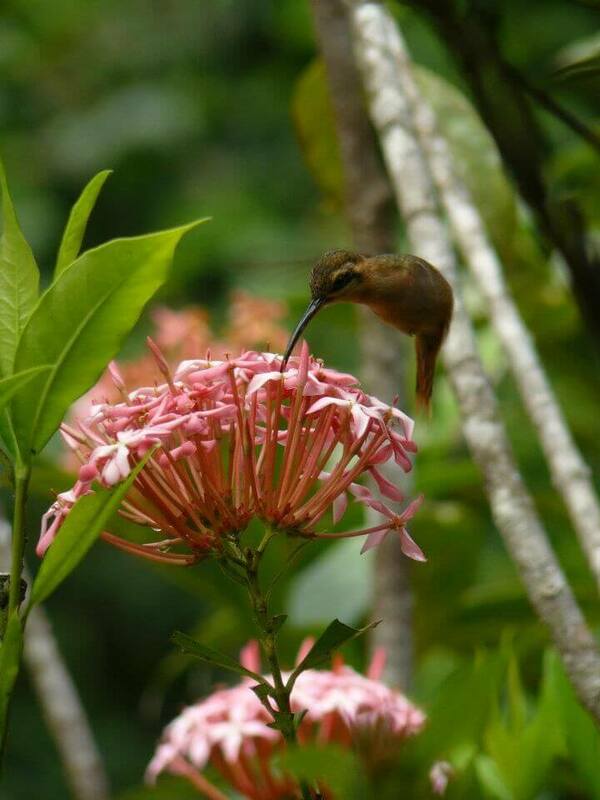 Thanks to the extraordinary high flapping frequency of its wings, the hummingbird can hover in order to feed. 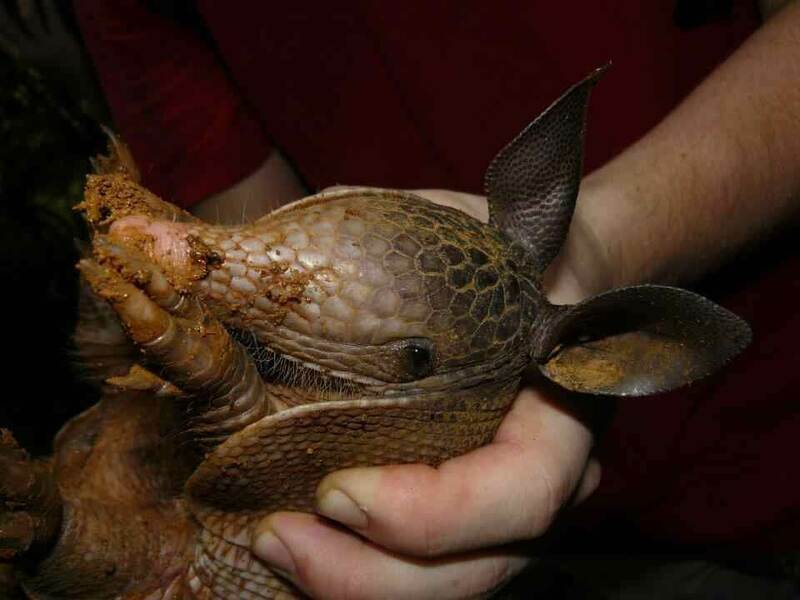 A half arboreal diurnal reptile that feeds mainly with insects. 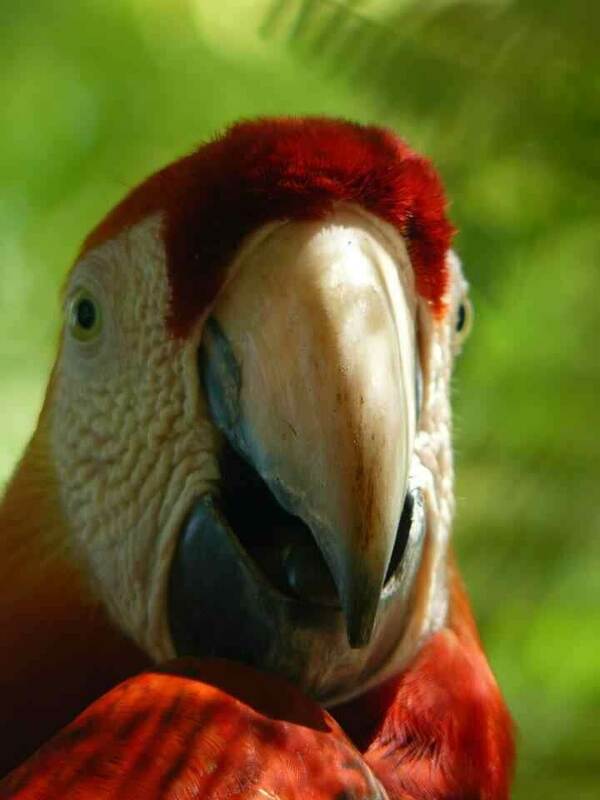 This kind of parrots have a colorfull plumage and a strong beak. 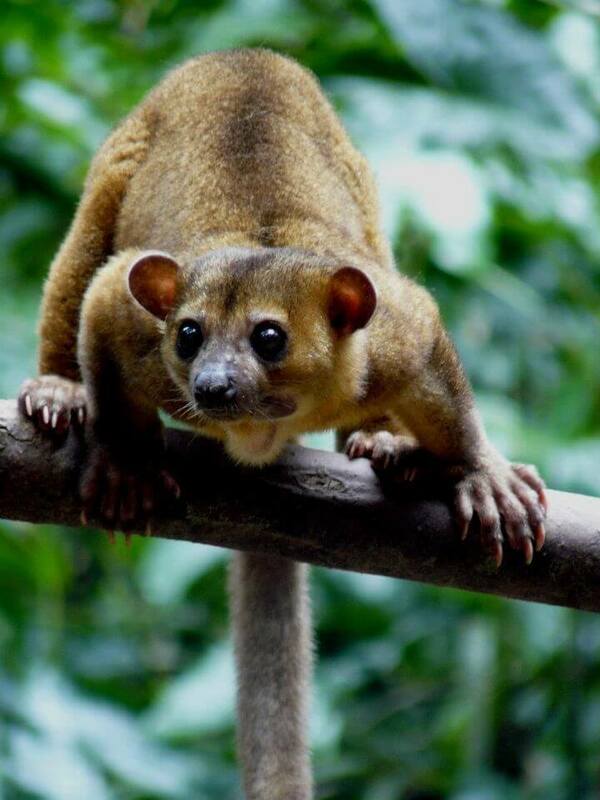 This specie is threatened with extinction. 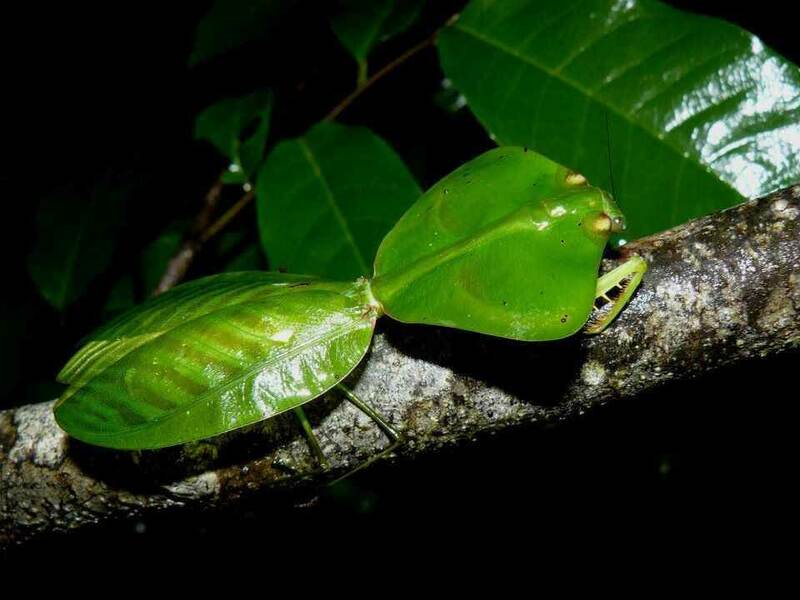 This insect shows an incredible cloaking technique. 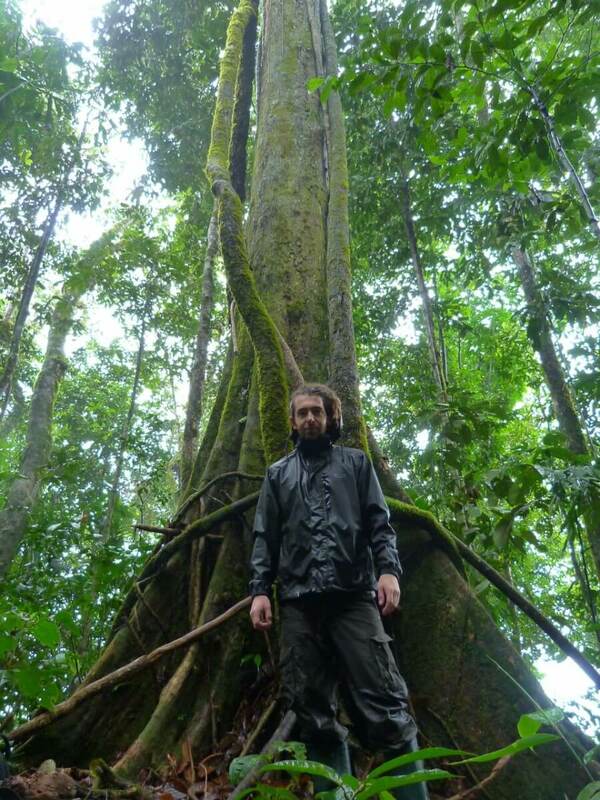 Amazon rainforest is the kingdom of primates. 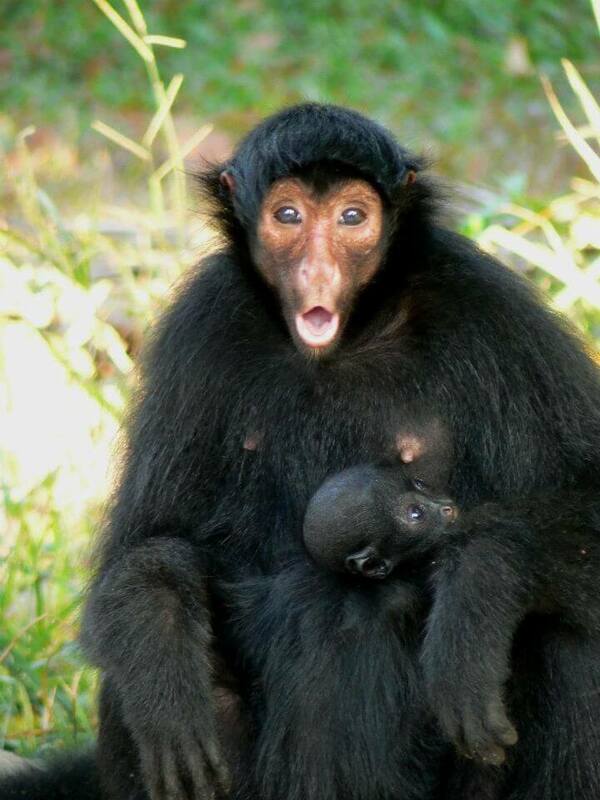 Night monkeys have hudge eyes which are very sensitive to light. 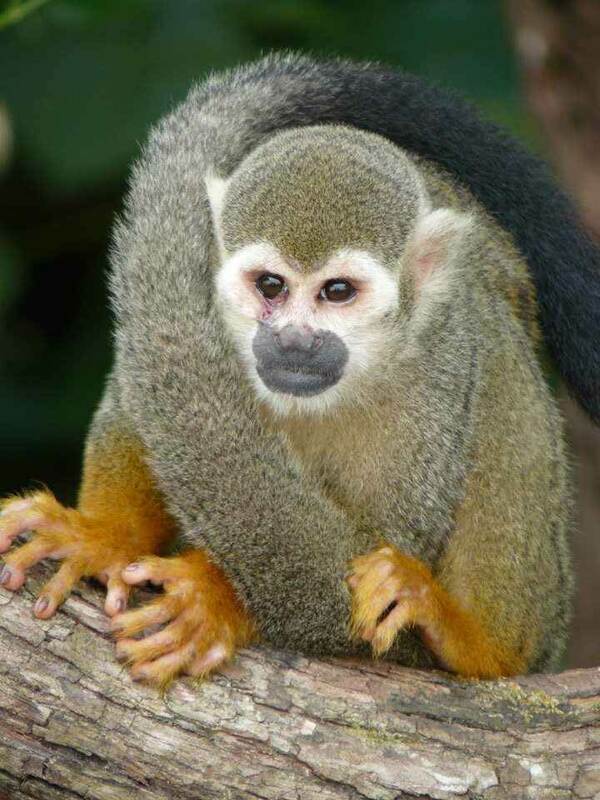 These monkeys are remarkable for their thick and prehensile tail. 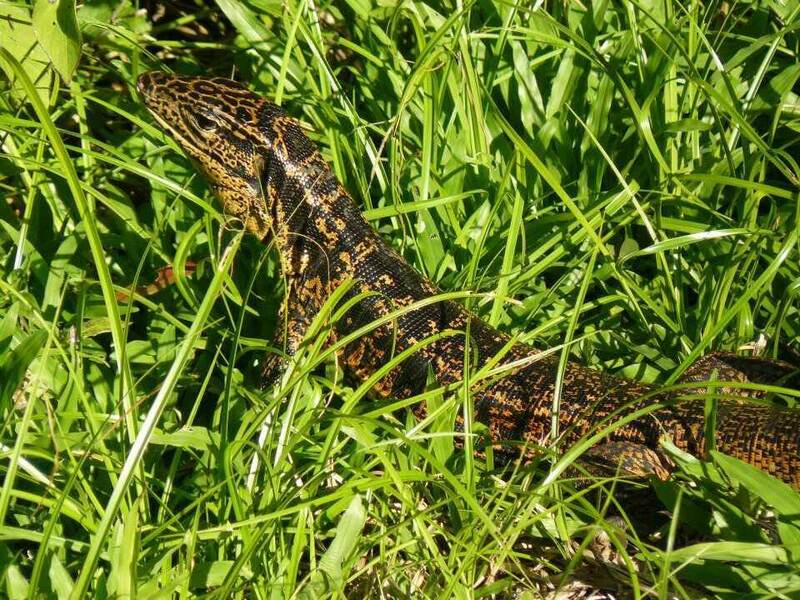 This massive animal can measure 2 meters long and weights from 300 to 600 pounds. Genetically it's close to horses and rhinos. 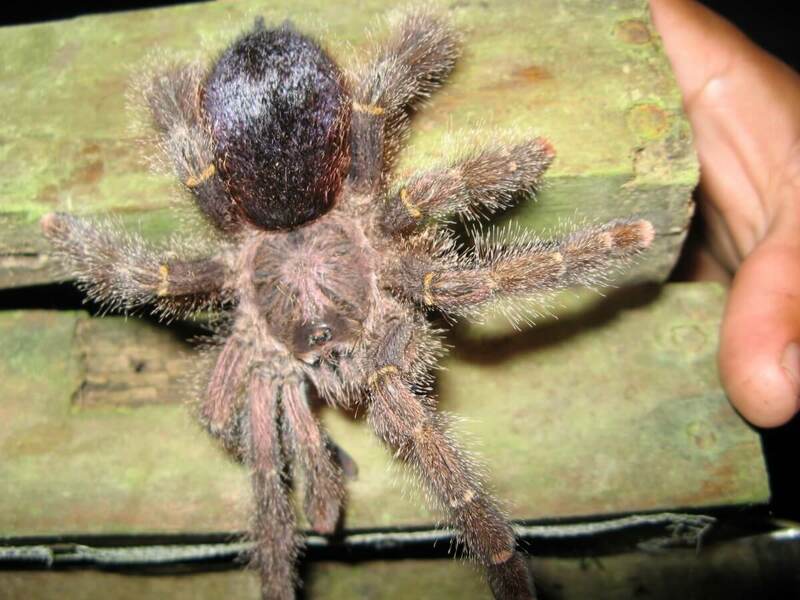 This gigantic trapdoor spider has been seen in the natural reserve of Cuyabeno close to the Colombian border.